A UNSC cruiser was the most powerful warship ever created by humanity. 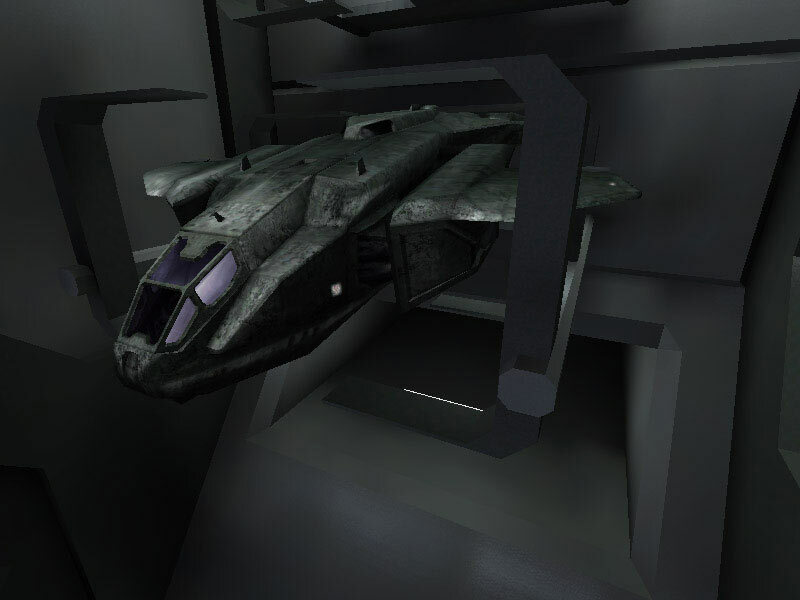 The Halcyon-class cruiser was a mainstay of the UNSC fleet for about half a century. The smallest human warship to receive the designation of cruiser, these still-enormous vessels exceeded a kilometer in overall length. Due to some experimental architecture in eleven ships of the class, these cruisers could hold their own in a firefight when many larger ships would have been too badly damaged to continue fighting. 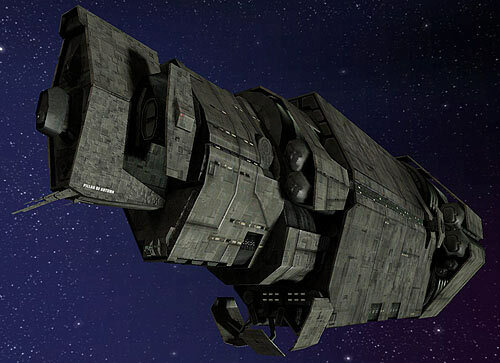 Of the 50 Halcyon-class cruisers constructed, one of the most noteworthy was the SCS Pillar of Autumn. Only her sister ship Dawn Under Heaven had almost as remarkable a history. 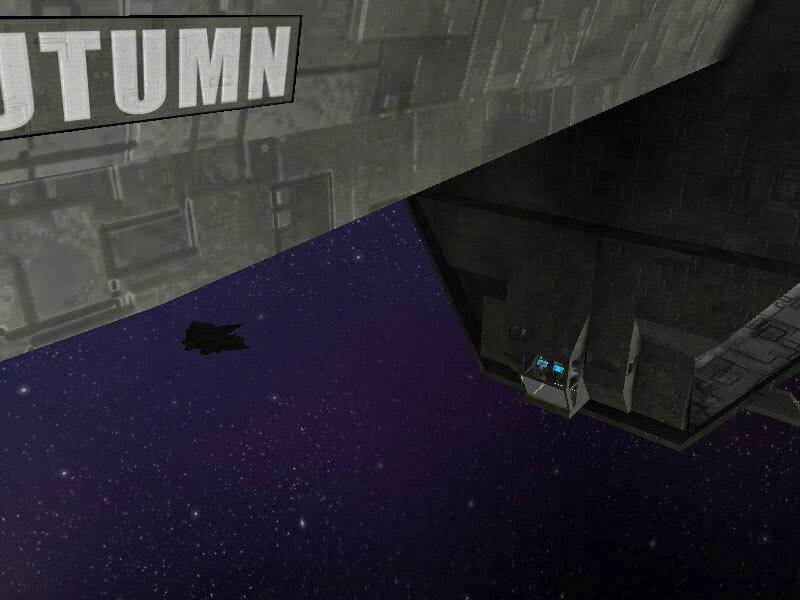 Later in its operational life, the Autumn did see some action in the combat theatre near Zeta Doradus (Onyx) in 2550. 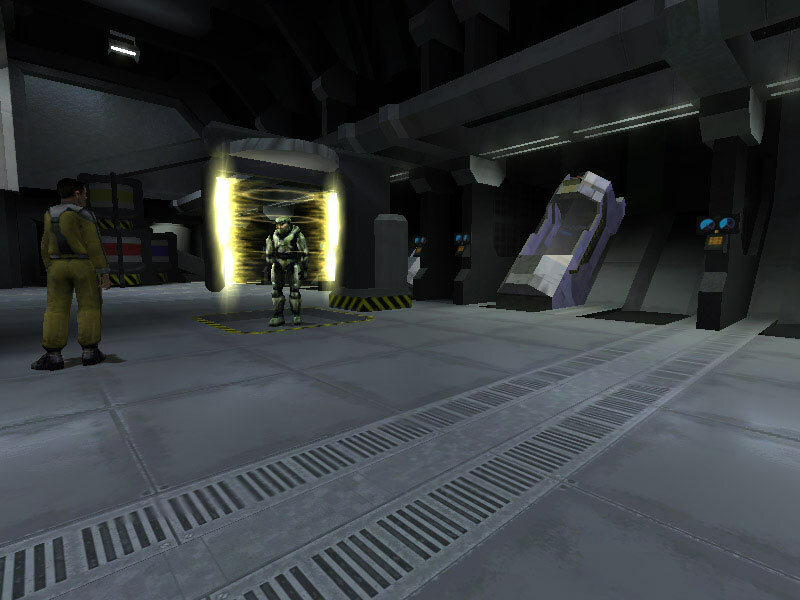 It was refitted for a newer mission in 2552 to try to put an end to the Covenant war by capturing a member of the Covenant leadership and forcing a cease to hostilities. That mission was suspended when the Covenant found and attacked Reach, the UNSC's primary naval base of operations and shipyards. The Autumn was in the system and saw her fair share of combat against the Covenant. When Reach's defeat was inevitable, the Pillar of Autumn activated its Slipspace drive to flee the system to avoid capture. 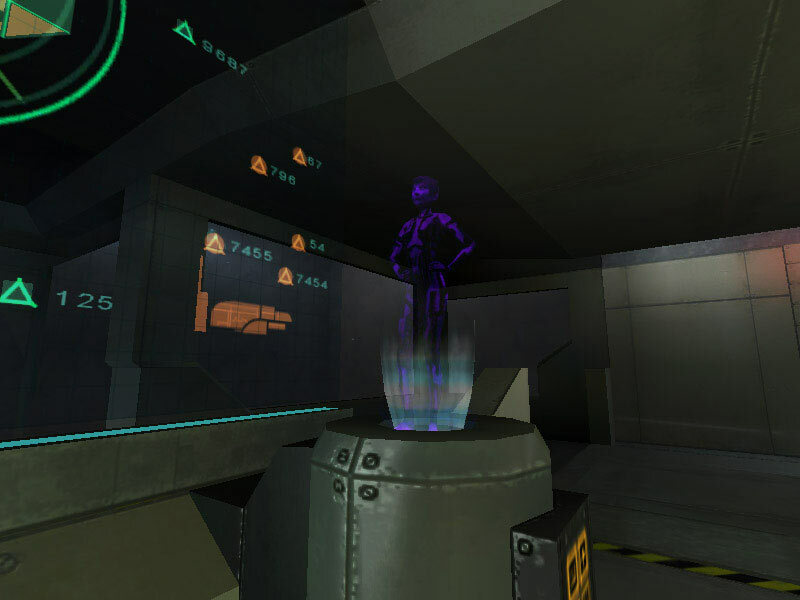 Although they were required to plot a random non-colony-vectored course out of the system, according to the Cole Protocol, the ship's mission AI, Cortana, programmed a stellar vector based on a set of coordinates found on an alien artifact. This led the Autumn and crew to a star system containing a derelict ringworld of alien origin. 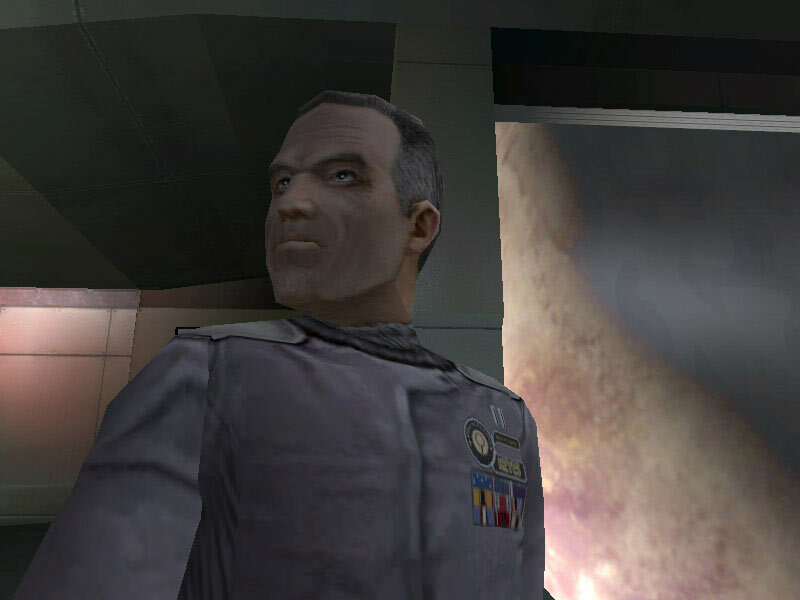 After another engagement with the Covenant, the Pillar of Autumn's commanding officer, Captain Jacob Keyes, ordered the damaged ship onto the surface of the ring in a somewhat-controlled crash landing. Most of the ship's complement was evacuated prior to the its touchdown via dropships, lifepods and HEVs, which included the Autumn's standard crew, a contingent of Marines, and one of the only known remaining Spartan-IIs. The ship was destroyed several days later by an intentional destabilization of its reactor anticipated to destroy the ringworld and prevent the spread of a parasitic species discovered on the surface of the ring. As is standard on all UNSC warships, the cruiser's outer hull was constructed from dense Titanium-A armor battle plate. The chemical name for this armor is known as Titanuim-50 (Ti-50); one of several stable isotopes of titanium. Another major hull metal was a TR steel alloy. Normally a silver-colored alloy, uncoated, it turns white if exposed to solar radiation. The ship's engine baffles are made from vanadium steel. As with all modern UNSC ships, the Halcyon-class was designed with structural hardpoints on its dorsal and ventral surfaces. 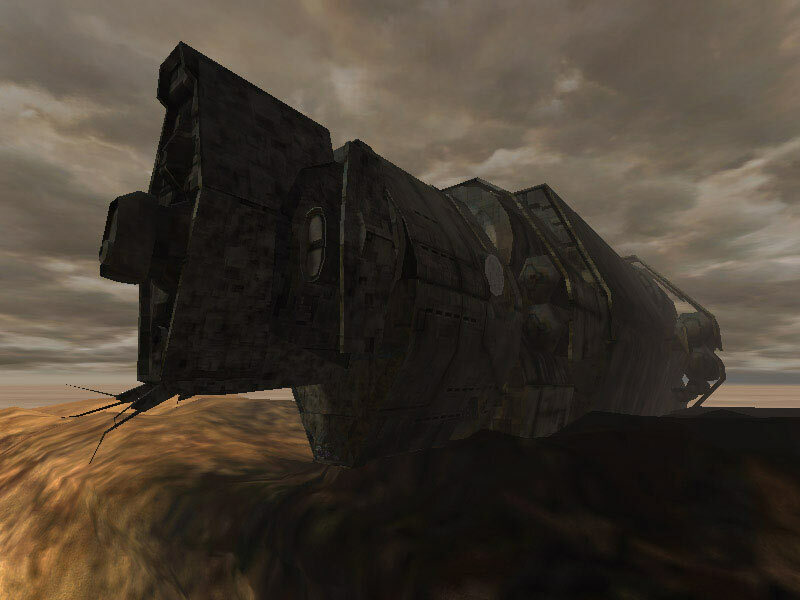 In the event the ship was too crippled to move under its own power, another UNSC ship could dock with it and ferry it from a combat zone to safety. Ships of the Halcyon-class' tonnage were not designed to operate within a planet's atmosphere. Atmospheric flight was limited to much smaller vessels. All massive vessels of this size and greater are built in zero-G environments, usually in orbit of a planet or moon. 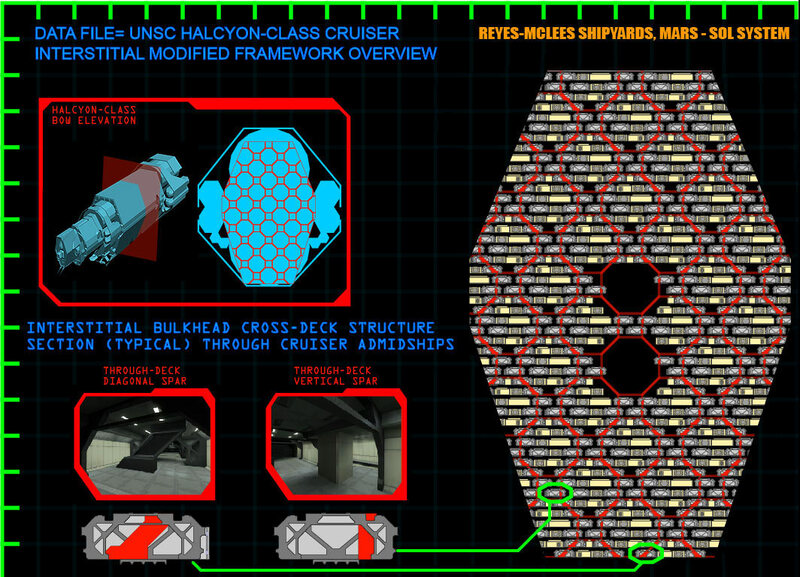 The internal skeletal structure of the Halcyon-class cruiser was primarily made from carbon-molybdenum (C-Mo) I-beams. This is actually common for all UNSC ship construction. What was not as common was that about a dozen of the Halcyon-class vessels were modified during initial construction at the Reyes-McLees Shipyards with an experimental framework of interstitial honeycombed framing members. The benefit was a superstructure that was extremely resilient to weapons fire and even collision damage from rebel ships. A ship with such a superstructure could still fight with breaches to all compartments and a 90% loss of armor. 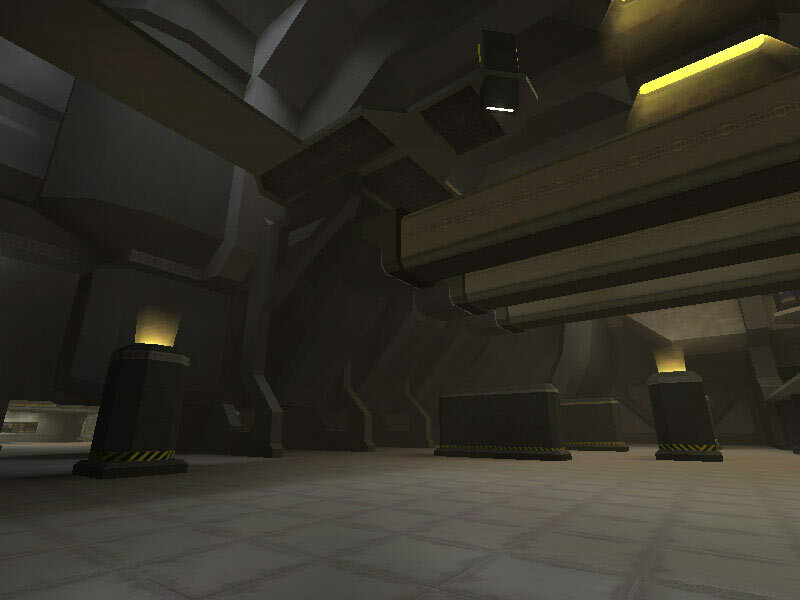 The drawback to the interstitial framework, beyond the added cost of construction materials and time, was the extra mass it added to the ship. It was ultimately deemed too costly to continue on the remainder of the Halcyon-class ships contracted for construction and was discontinued after the eleventh Halcyon-class was built. 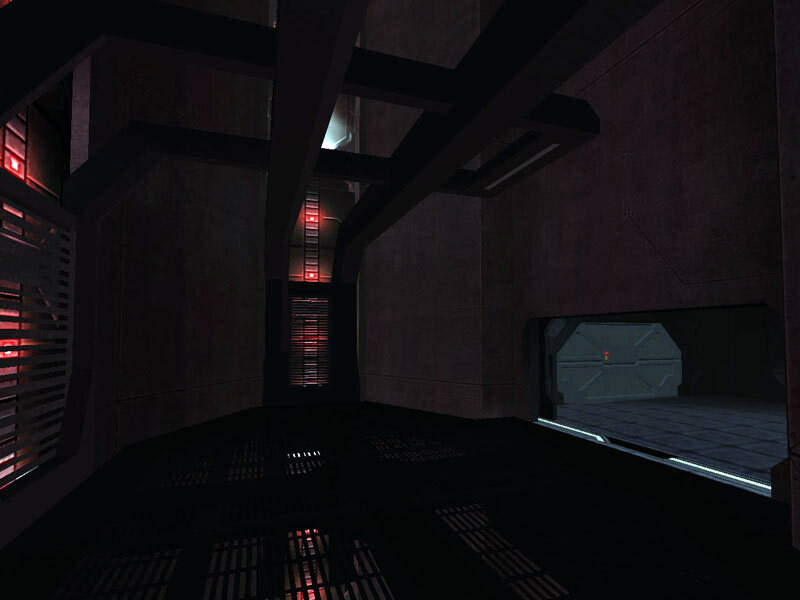 The SCS Pillar of Autumn was one such vessel with the experimental framework. 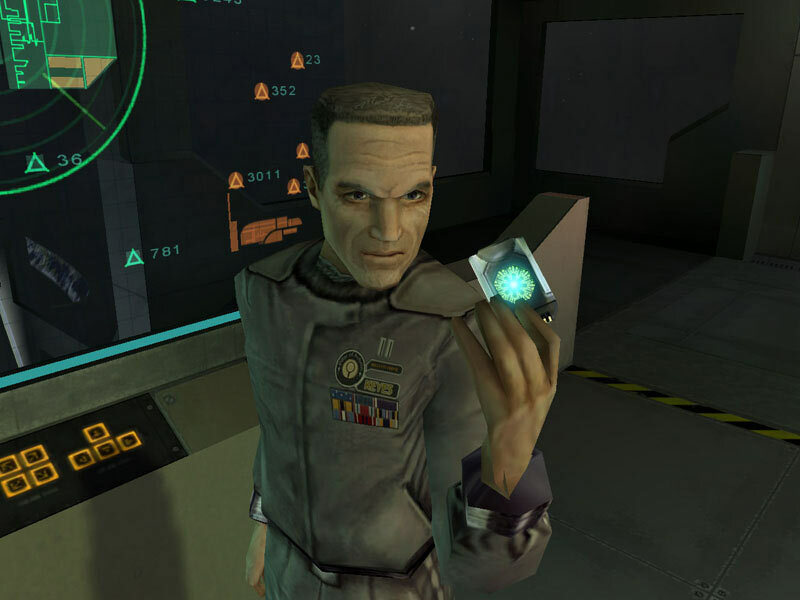 It was chosen for the mission to infiltrate the heart of the Covenant for that reason. Although it was an older ship by 2552, it was solidly built. 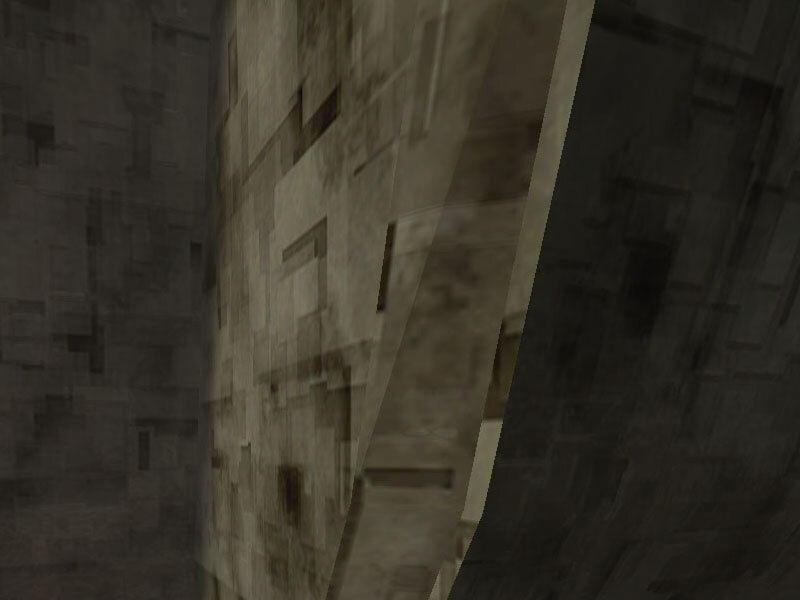 Most compartments on the Pillar of Autumn were of modular construction. 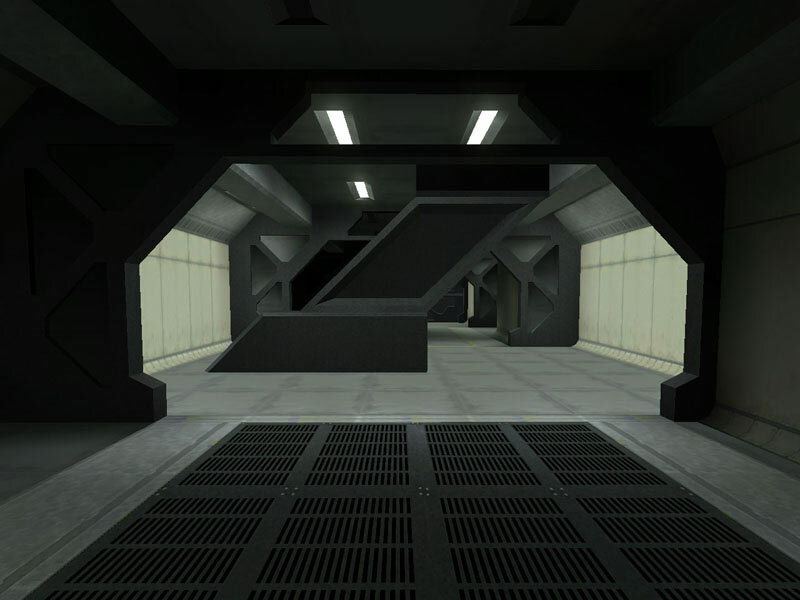 In addition, each compartment and many corridor segments could be sealed off from one another. 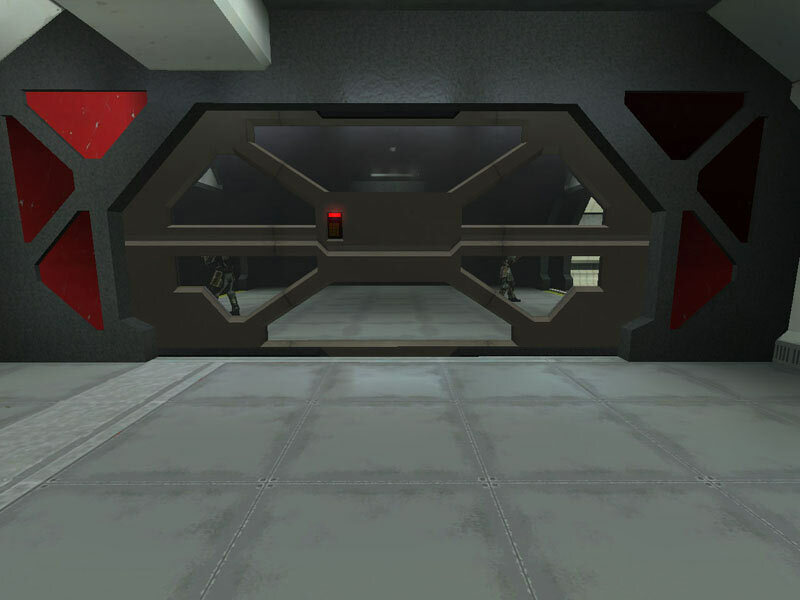 In cases of tactical emergencies, such as a threat force boarding scenario, compartments could be closed off from one another to delay the advance of enemy incursions. 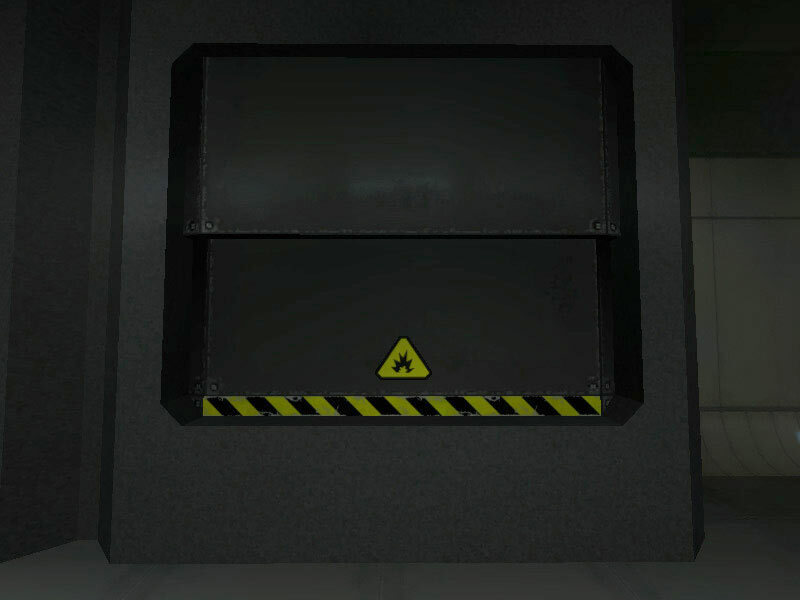 In other circumstances, such as a hull rupture due to space debris or the intentional collision of a threat vessel or weapons fire, bulkhead doors could close automatically to seal off the affected area to minimize explosive decompression damage and protect the crew and internal ship systems. 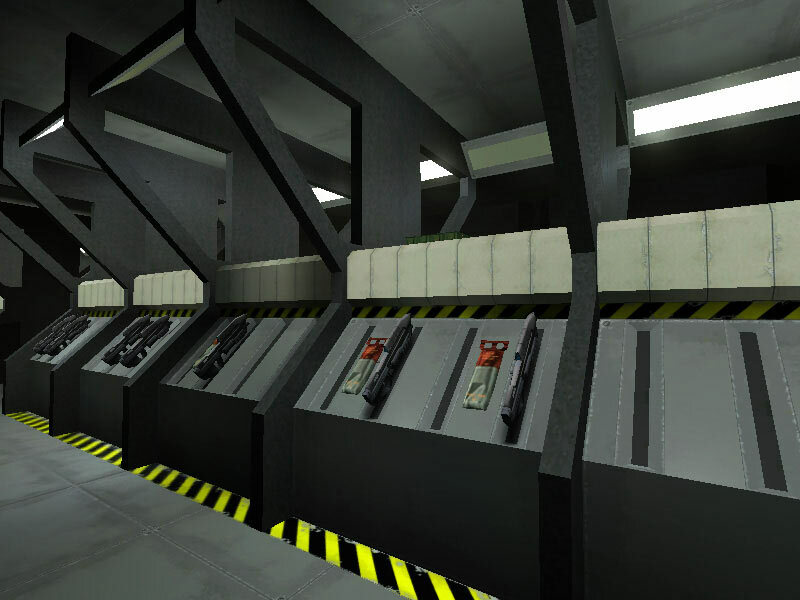 Some corridor components had bulkheads from the interstitial framing members constructed into them. 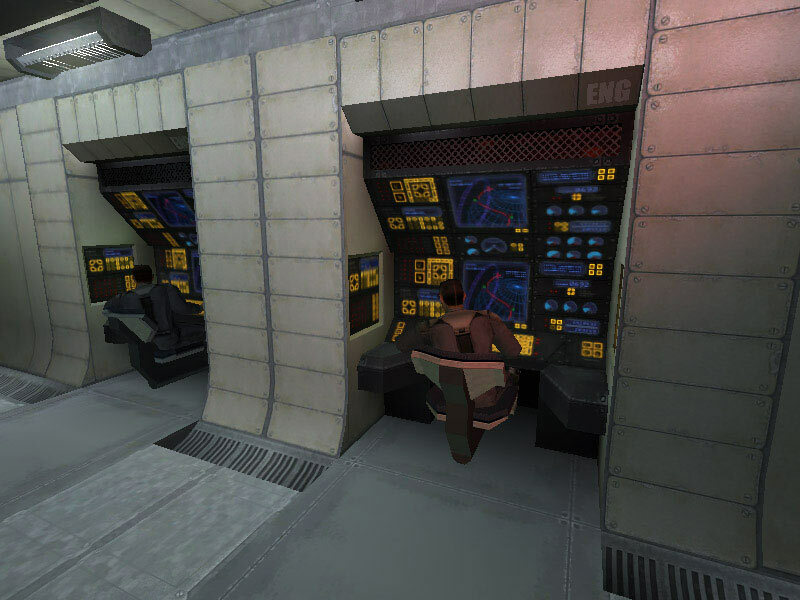 This sometimes made for awkward crew passage (especially with equipment), but the frames were necessary to the extended integrity of the hull. These beams ran diagonally floor-to-ceiling through the center of the deck. Major deck bulkheads were common in many corridor junctions. 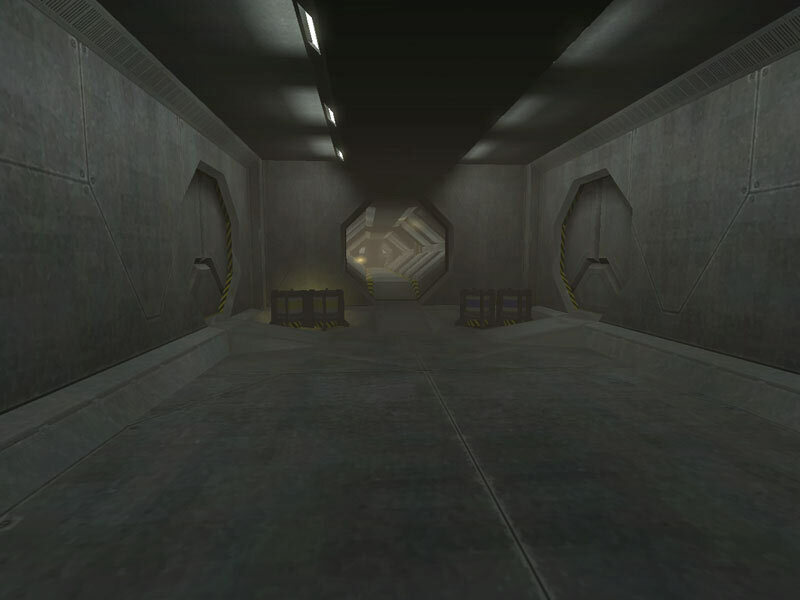 Some sections of corridors didn't lead anywhere. 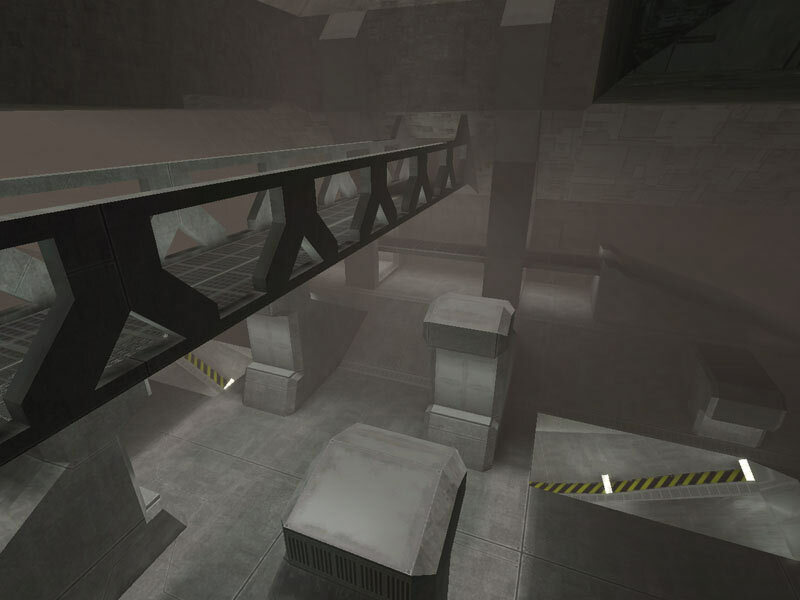 In these cases, there was some major structure beyond that didn't allow the corridor to pass through or a compartment to be made. It was not uncommon for these corridor ends to house cargo drums or crates. Access to the numerous decks on the Autumn were facilitated by elevator (both passenger and cargo types), by stairs, or via interdeck ladders in the maintenance accessways. 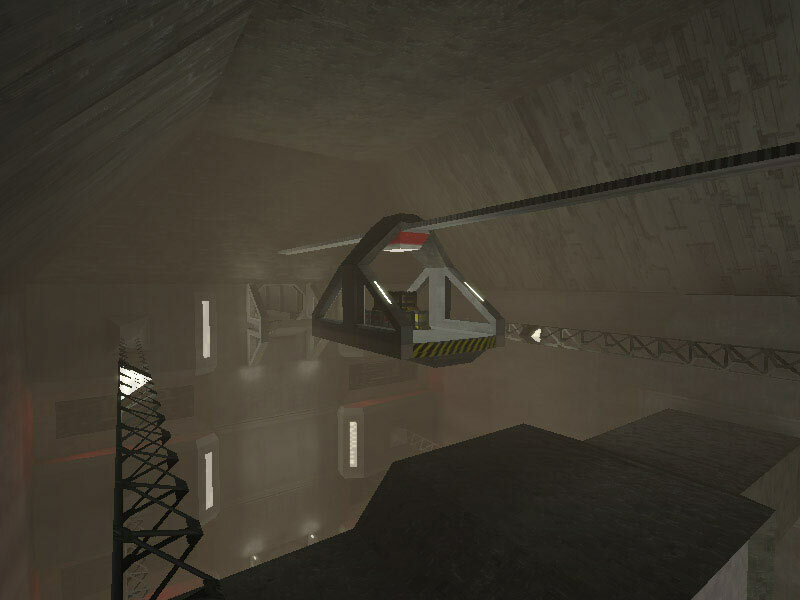 Artificial gravity was still considered experimental at the time of the Pillar of Autumn's mission in 2552, although several ships had been using these grav systems for some time. Many of the Autumn's decks were retrofitted with gravity plating within the substructure of the decks. 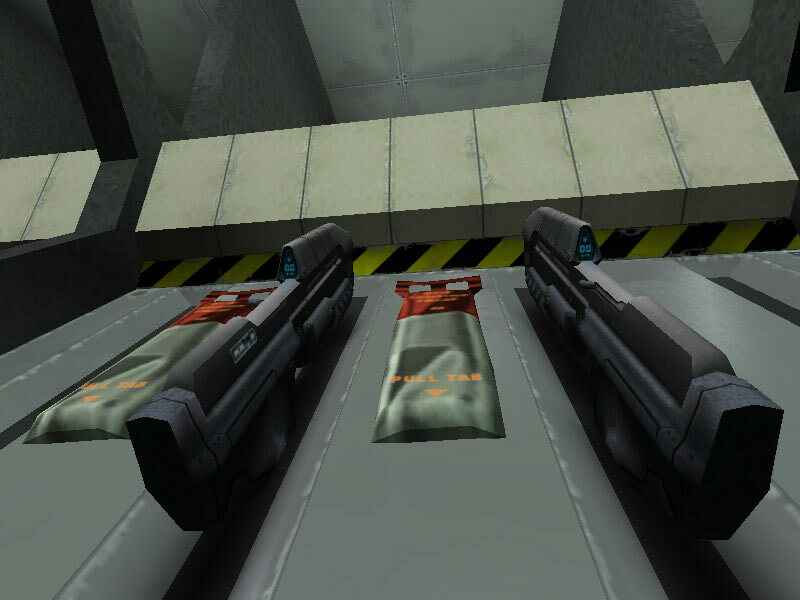 Some was old UNSC technology and the remainder was supplemented from reverse-engineered Covenant technology. 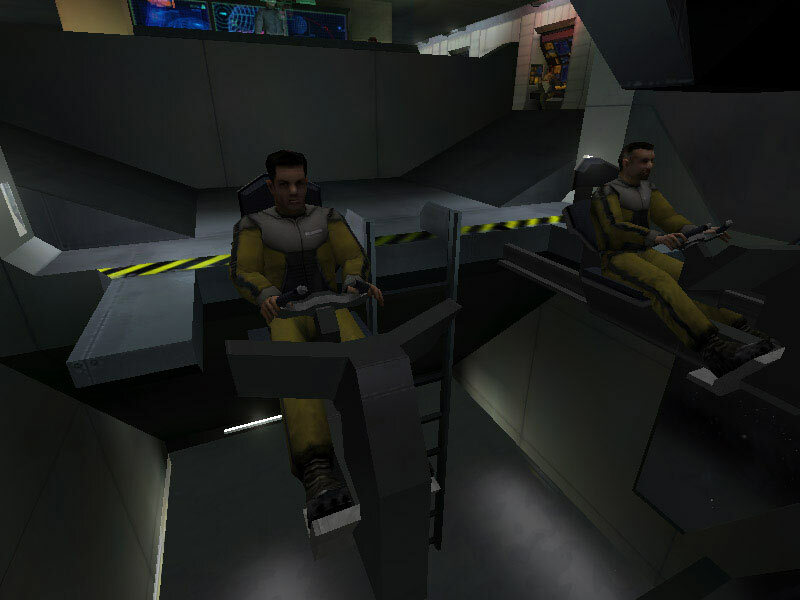 There were some older sections of the ship which still retained rotating sections from the ship's initial construction that aided in simulating a gravity field. These sections were entirely enclosed within the vessel. 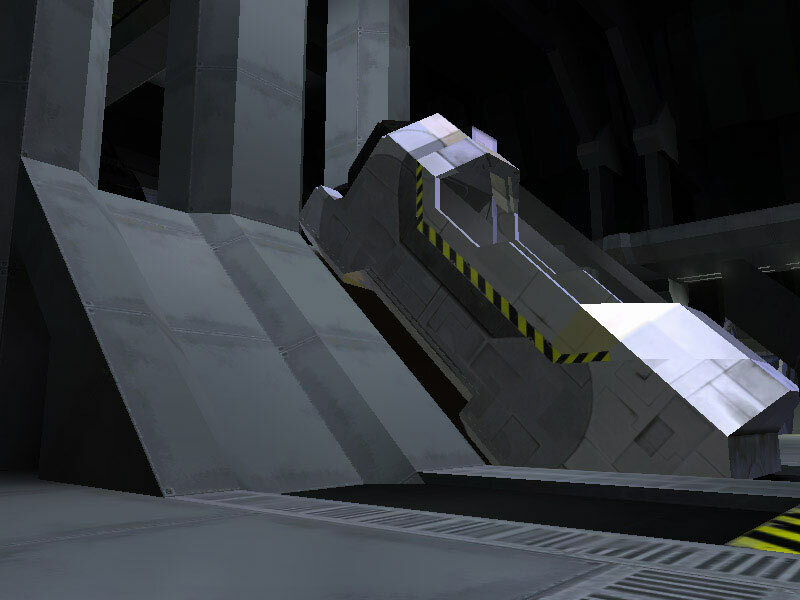 As with many older UNSC ships, the Halcyon-class' main bridge was located near the ship's bow. 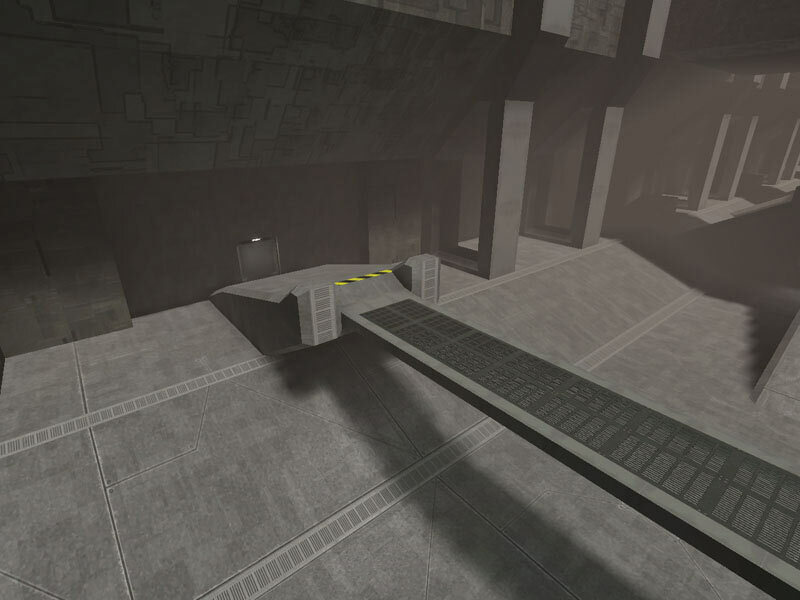 The bridge was a rectangular compartment with stations for navigation, engineering, weapons, tactical, communications, emergency ops, and the AI computer interface. This forward-most bridge station had an unprecedented view of space out the bow of the ship. The navigation officer (starboard), and to his left, the weapons officer (port), sat in seats which extended into the glass-enclosed alcove at the very front of the bridge. 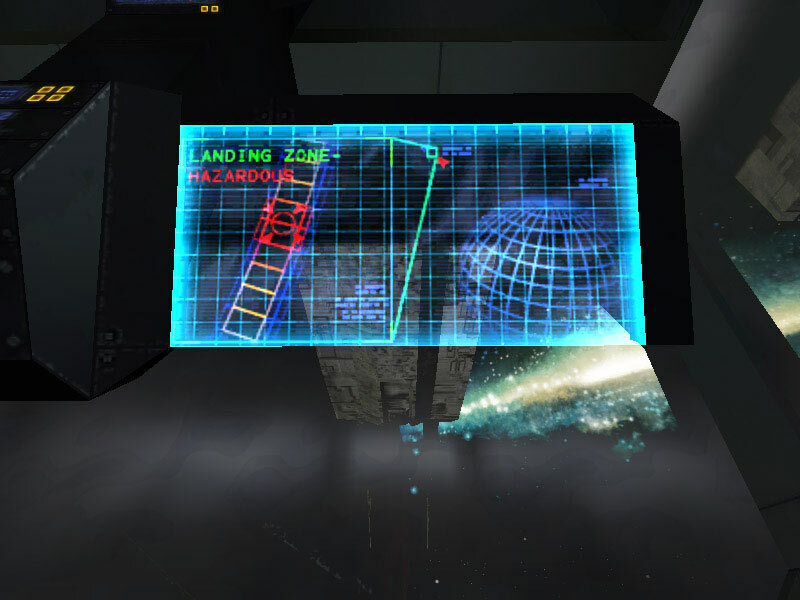 Access to the ship's NAV core and celestial database was available from this station for all flight needs of the vessel. Three additional NAV stations provided pertinent information for the commanding officer at the area directly behind the captain. There are two engineering monitoring stations on the bridge. 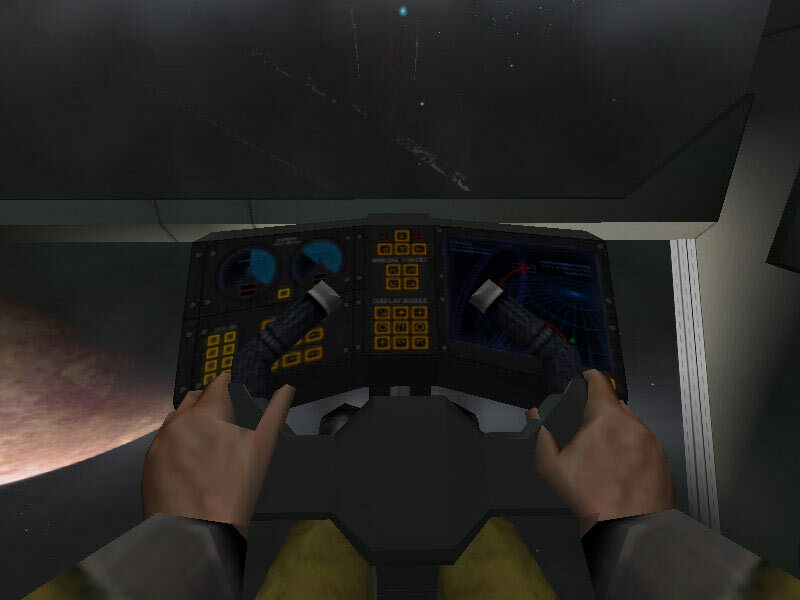 These two consoles are near the aft-starboard area of the bridge. The aft bulkhead of the bridge contains maintenance access and engineering monitoring functions for the ship's life support systems. At the very front of the bridge, was the fire control station occupied by the weapons officer. 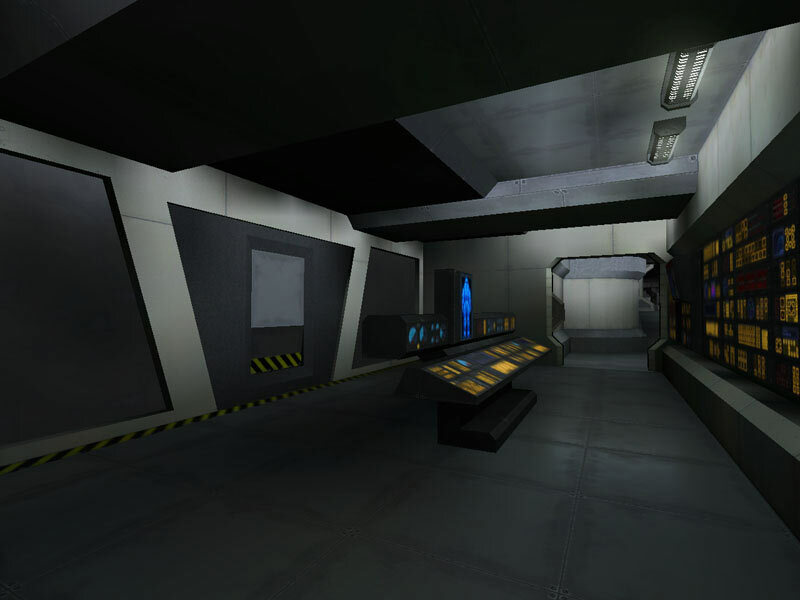 This was the portside station next to the navigation officer. 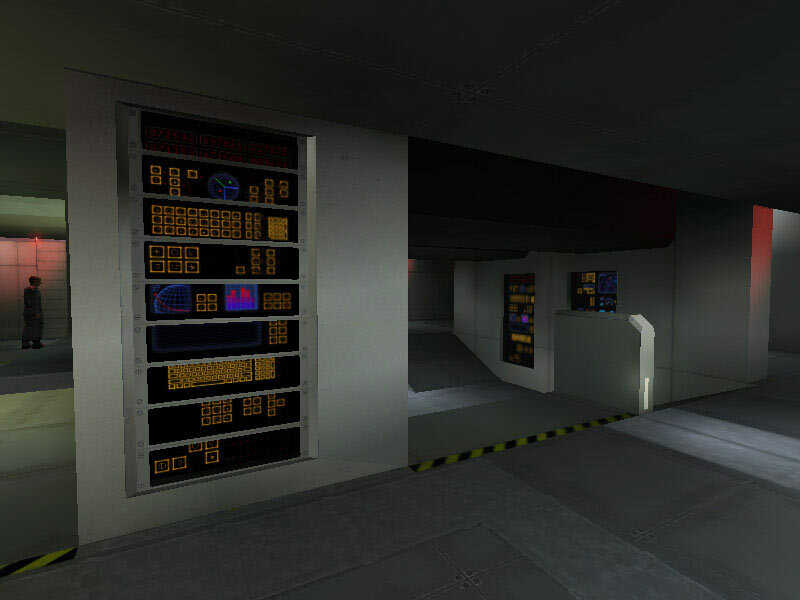 The Autumn had three stations labeled as Tactical, though the stations were each specialized into separate functional operations. 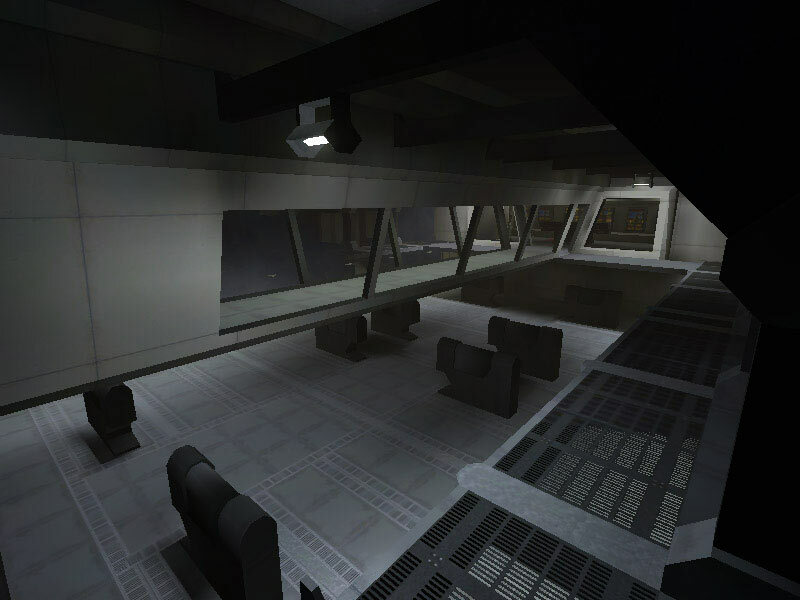 They are located on the starboard-fore and in a sunken area in the center of the bridge compartment. 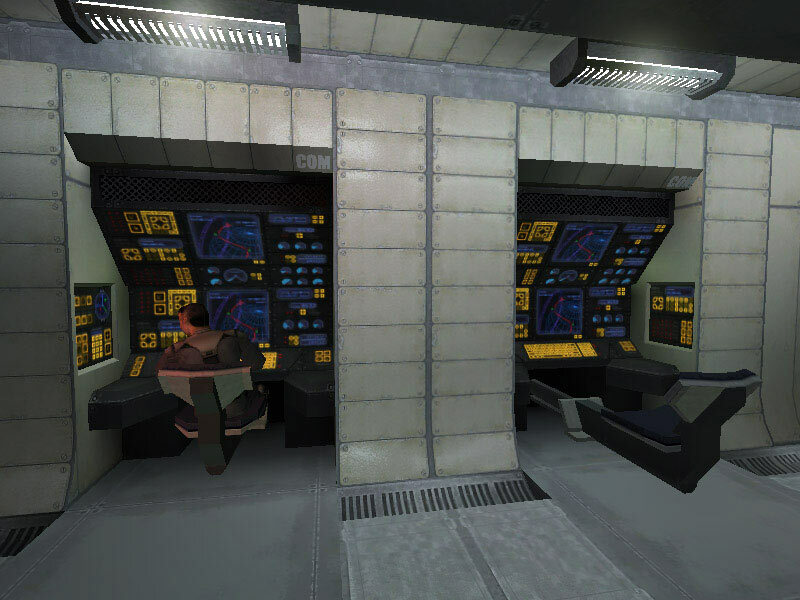 The station near the front of the bridge, in easy view of the captain, deals with the ship's internal security. 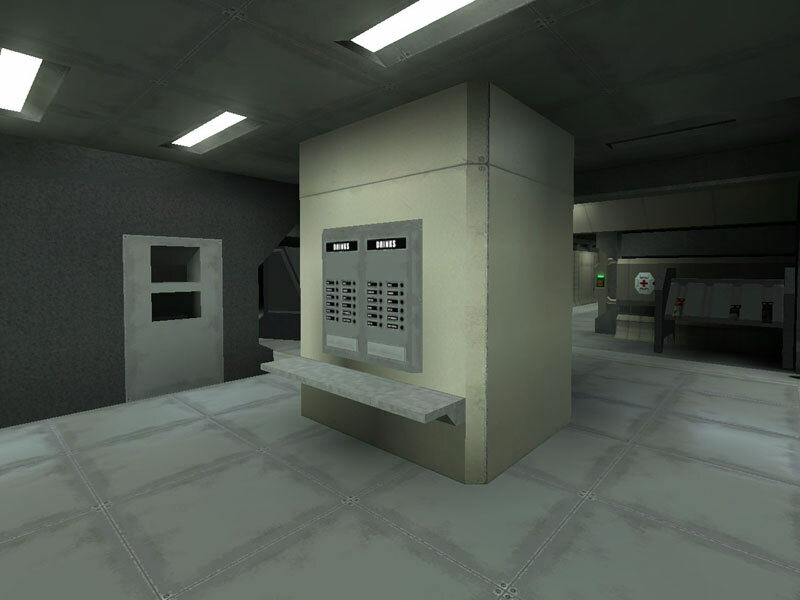 Security stations and brigs, the weapons lockers and armories, and even enemy boarding attempts are all controlled and monitored through this console. 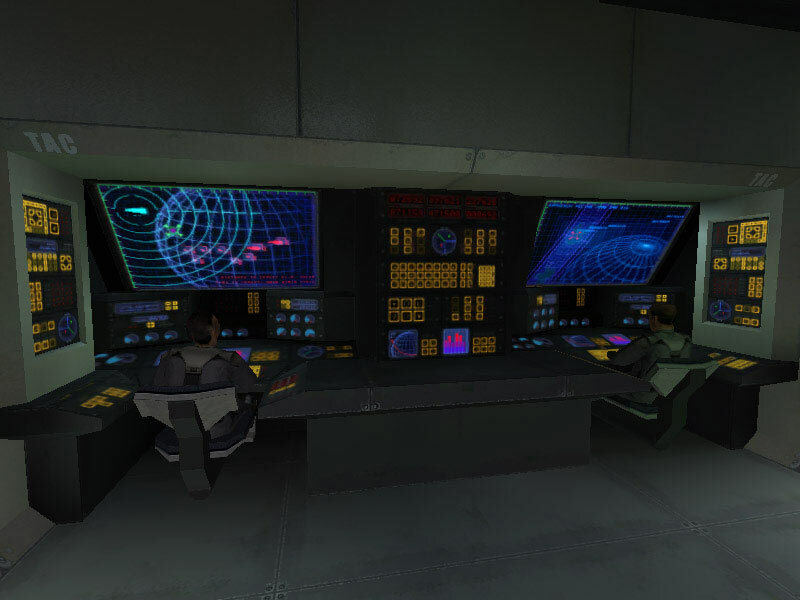 The dedicated TAC stations in the bridge's center are for monitoring of external threats to the ship. This area of the bridge has room for several crewmembers and facilitates situational meetings between security personnel and the captain. 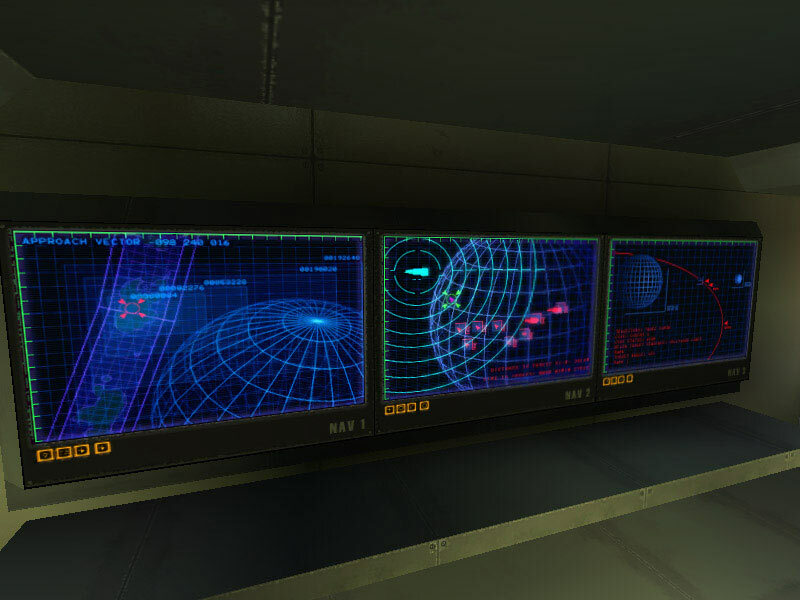 The stations monitor the preparation and deployment of ship-to-ship weaponry, calculates the threat level of objects and ships in the vessel's path, and links up with the NAV station to provide relevant tactical data of potential navigation hazards, both natural and artificial. 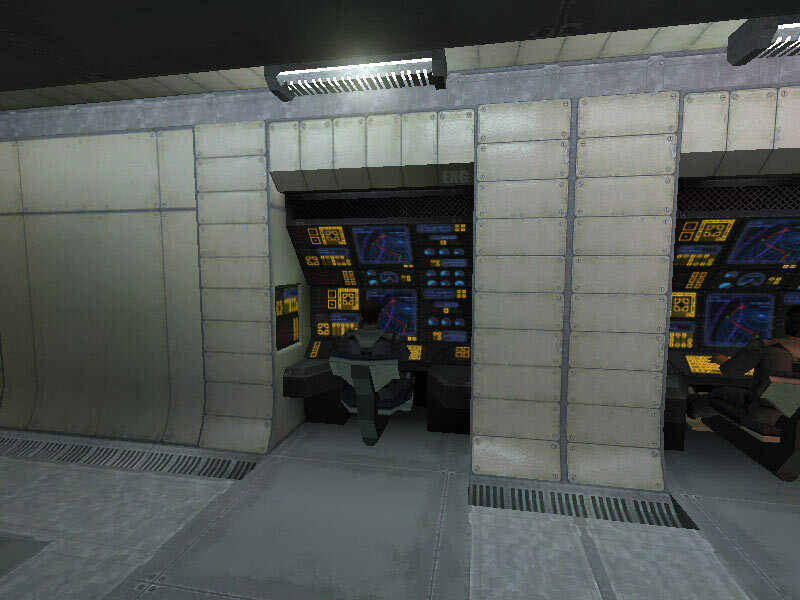 There are two communications stations on the Autumn's bridge, both aft-port stations. 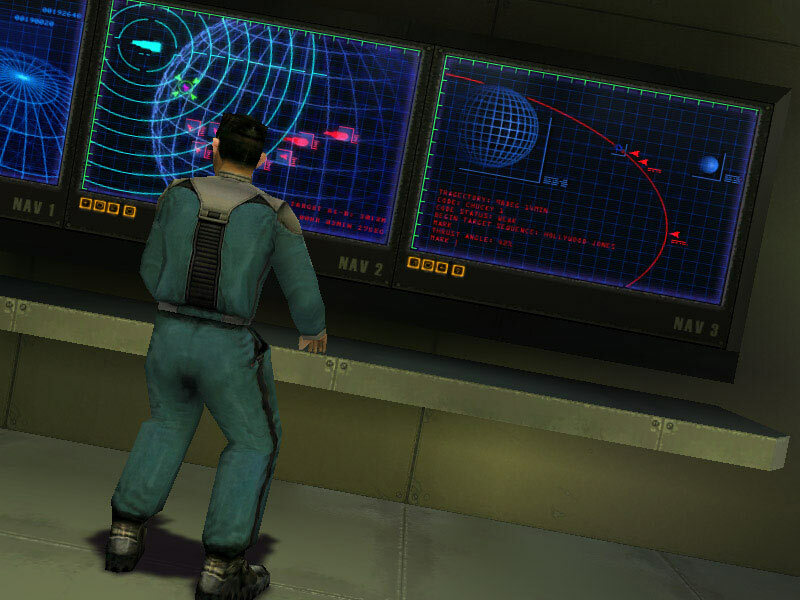 One of the COM stations primarily deals with short- and long-range communications from UNSC bases and stations, top secret communiqués from the Office of Naval Intelligence, and handles inter-ship communications. These would routinely monitor D-band transmissions, the UNSC standard, as well as E-band, the emergency broadcast channel. 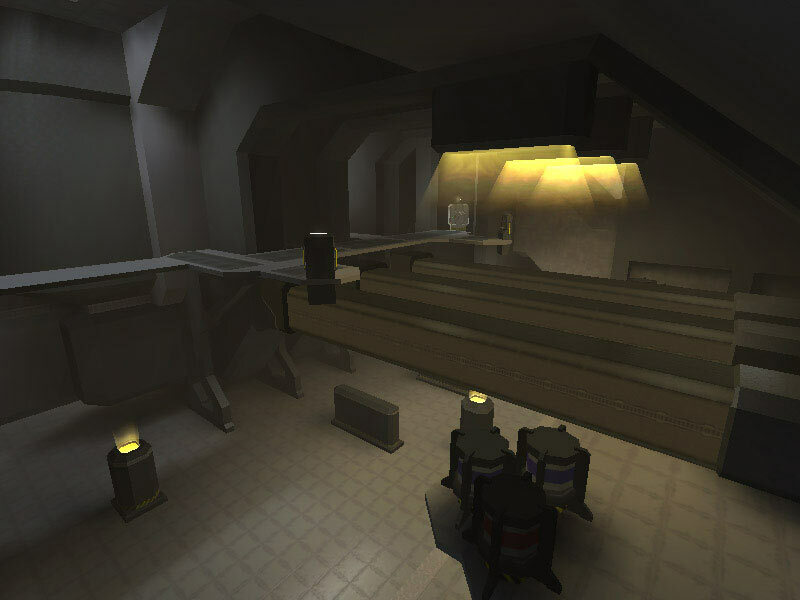 The other station is often used for enemy transmission intercept, decryption analysis, and signal sorting. 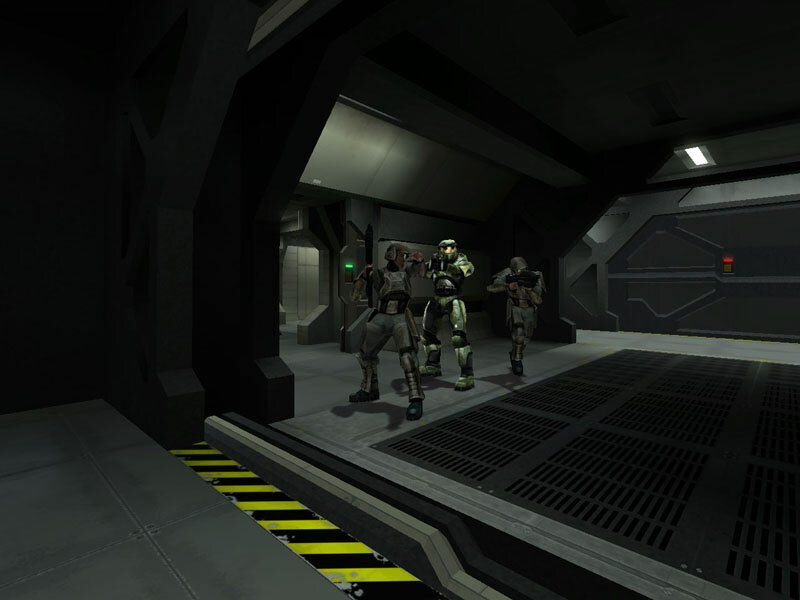 Although used by the UNSC, some Covenant communications had been discovered to use F-band through K-band transmission frequencies. AThe Emergency Operations station is near the port-fore end of the bridge. It prepares for evac situations, monitors lifepod operations, and provides the captain with emergency situational data during alert conditions. 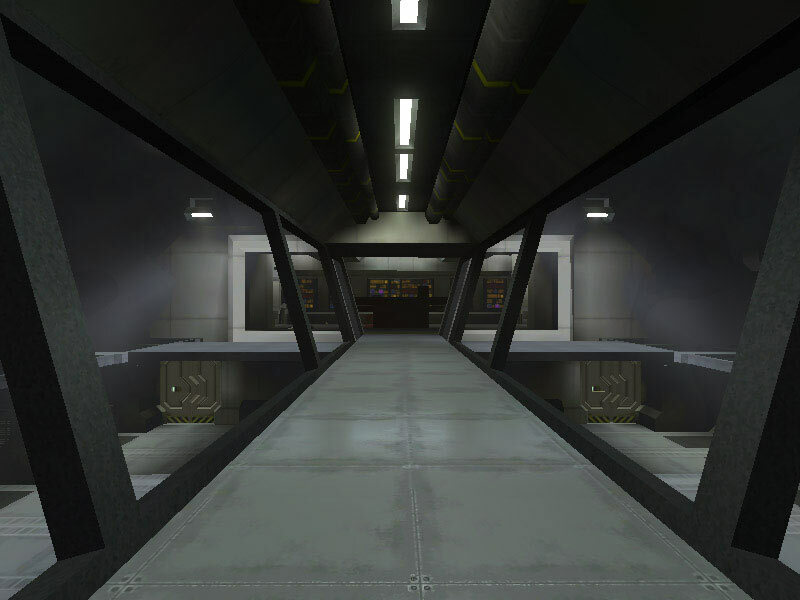 The AI holotank is located near the forward center of the bridge near the captain. It contains an upper holographic projector for the AI or 3-dimensional data, and a memory chip slot in the base of the tank for AI download. 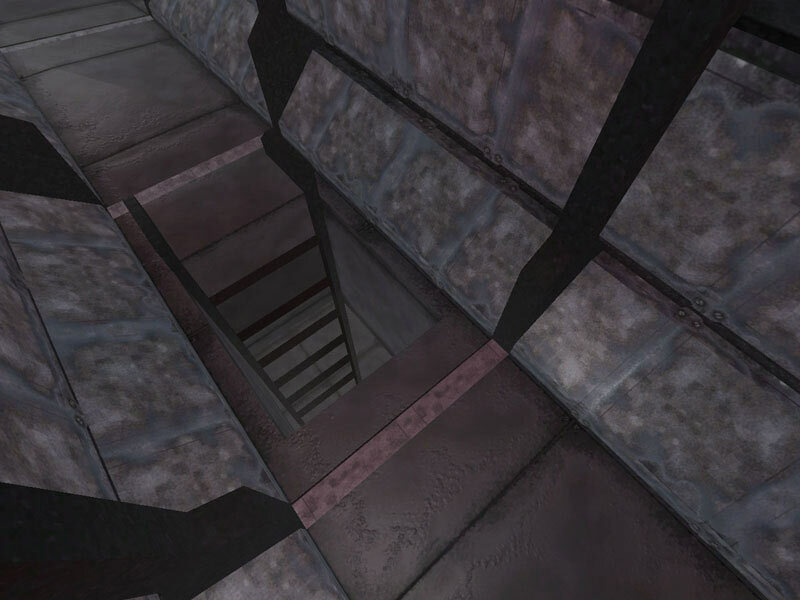 The Main Engineering room on the Pillar of Autumn was a four-storey high compartment. It was the largest single compartment within the normal habitable volume of the ship. 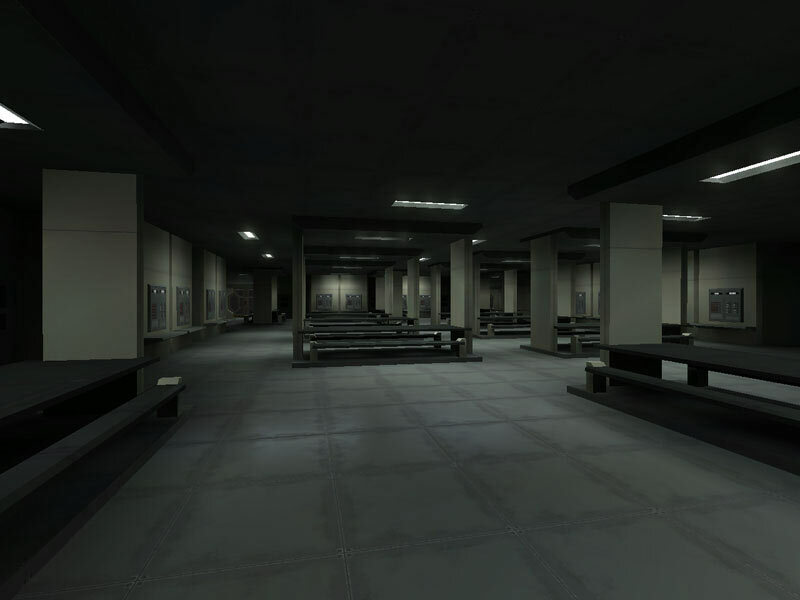 (There were some larger spaces such as service corridors and hangars, but they were able to be vented to space.) 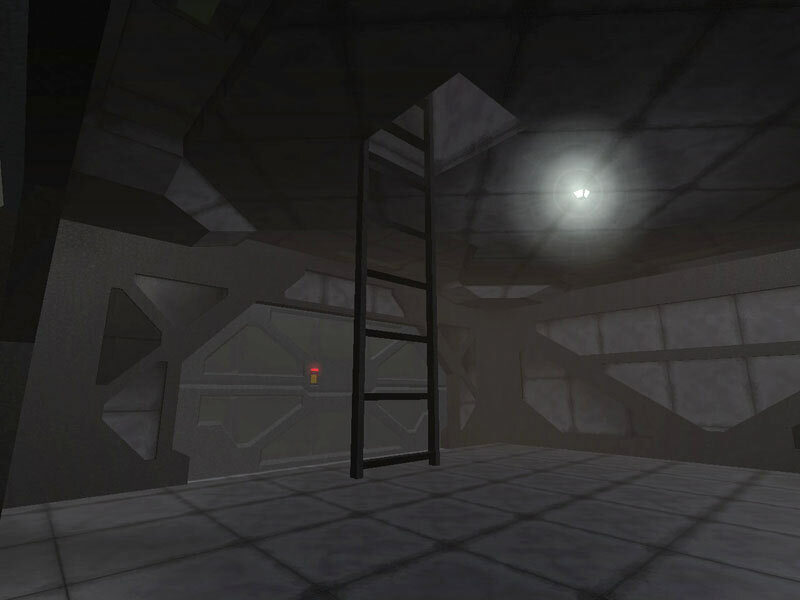 There were two main access points to the Autumn's engine room. 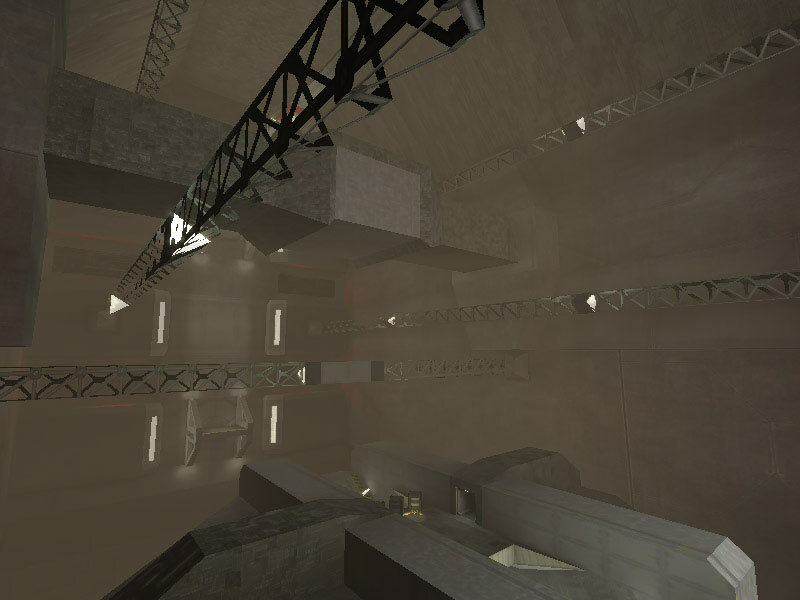 There were three crew-accessible levels within engineering. Vent core monitoring was accessed from Level 3, at four stations around the main reactors. 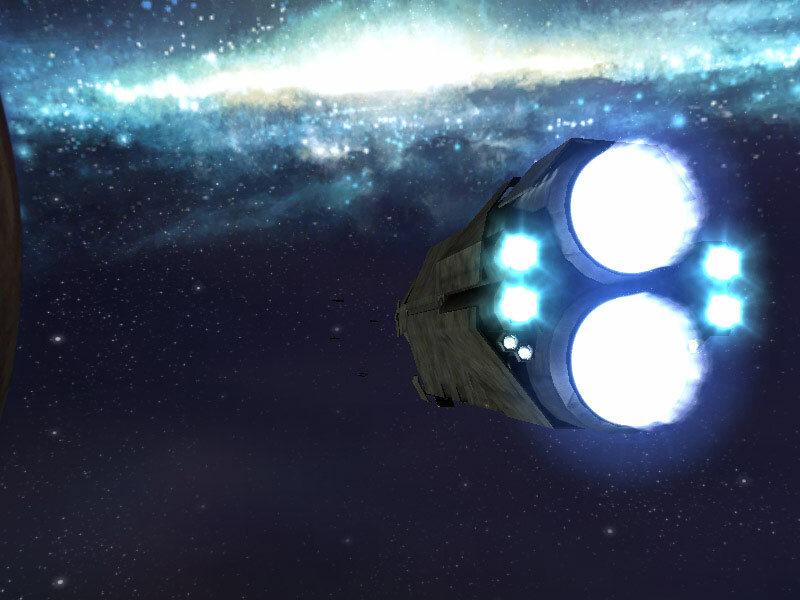 Sublight Propulsion: The Pillar of Autumn was equipped with a unique network of three Mark II Fusion Reactors. 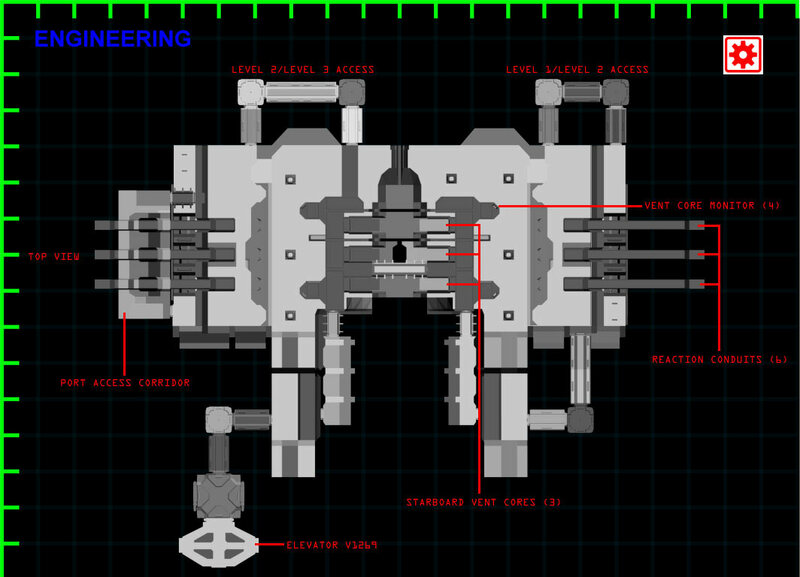 The composition of the engine components included the three fusion engines, the primary fusion chamber, the secondary reactor, the convection inductor, and four vent cores covered by manifolds. These manifolds are exhaust couplings that conceal the primary fusion drive core. The fuel these reactors utilize is drive plasma. Despite this innovation, the Autumn could only generate a tenth of the overall power that a ship with a more current reactor could. 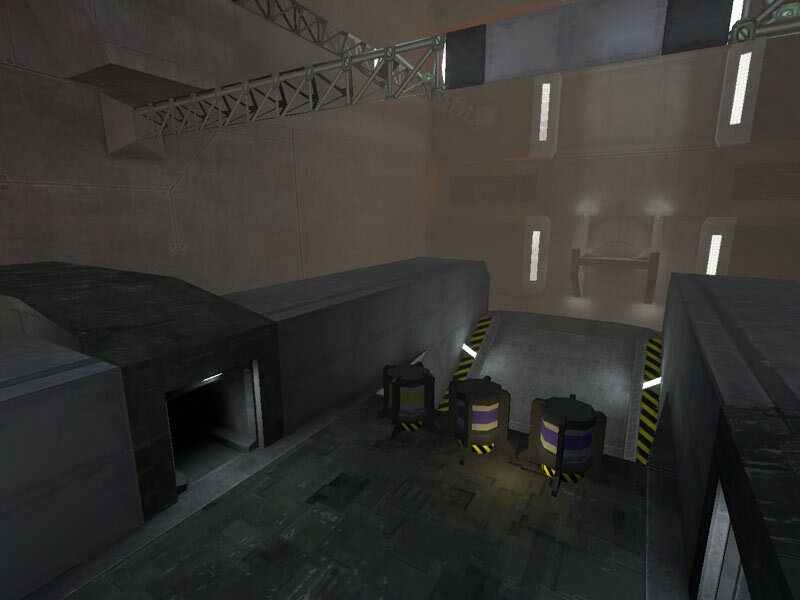 Slipspace Propulsion: The Slipspace engine contained a super-cooled, superconducting magnet. The acceleration matrix of the Slipspace drive emitted alpha and beta particles. The drive used particle accelerators to rip apart normal space-time by generating micro black holes. Those singularities evaporated via Hawking radiation within a nanosecond. The real quantum mechanical "magic" of the drive was how it manipulated those holes in space-time, squeezing a multi-thousand-ton vessel into Slipstream space. 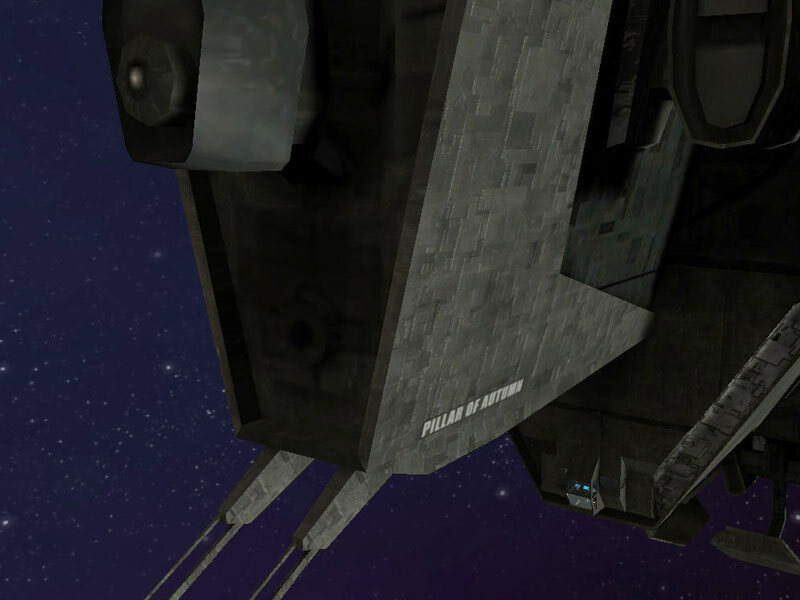 For point defense of the Pillar of Autumn, the ship had a total of 40 retractable 50mm autocannons. These recessed cannons provided adequate tactical coverage around the vessel for any small ships or fighters that had gotten close enough that Archer missiles or the MAC gun were not viable offensive options. The control systems for point defense included external cameras (including long-range) and included other ling-range detection gear. An offensive mid-range weapon system, Archer missiles were a mainstay of UNSC ship-to-ship combat. Inside the round hatch covers of each Archer missile pod were 24 missiles. Each missile was a guided projectile that could be redirected in-flight if the tactical situation changed the effectiveness of the initial firing solution. They were more effective en masse than individually and ship commander often unloaded a salvo of entire pods at a time in battles with Covenant ships in particular. 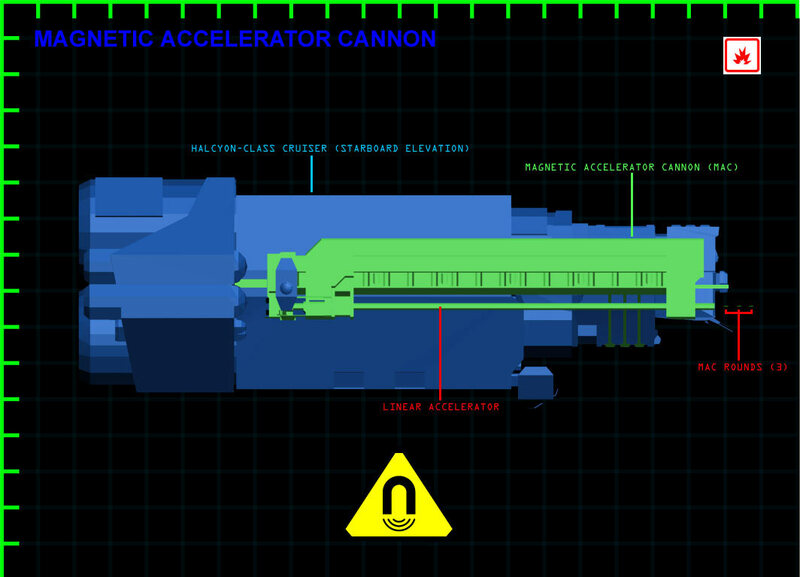 The MAC gun, or Magnetic Accelerator Cannon, is standard equipment on most modern UNSC vessels. 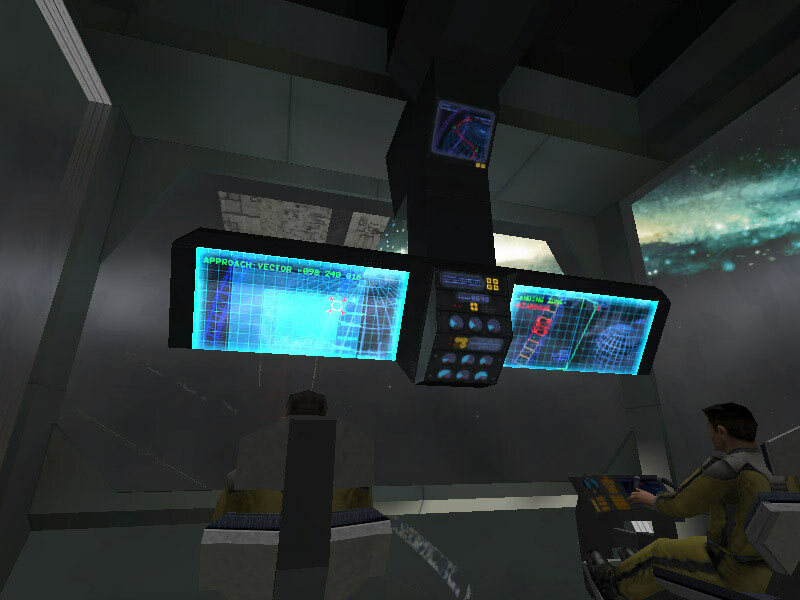 The Pillar of Autumn was retrofitted for its mission in 2552 with a somewhat experimental configuration of its MAC system. Most MAC systems had to recharge the magnetic fields between bursts, but the Autumn had a system modified to fire 3 MAC rounds on a single charge. Magnetic field recyclers and booster capacitors allowed for this one-charge, three-shot advantage. 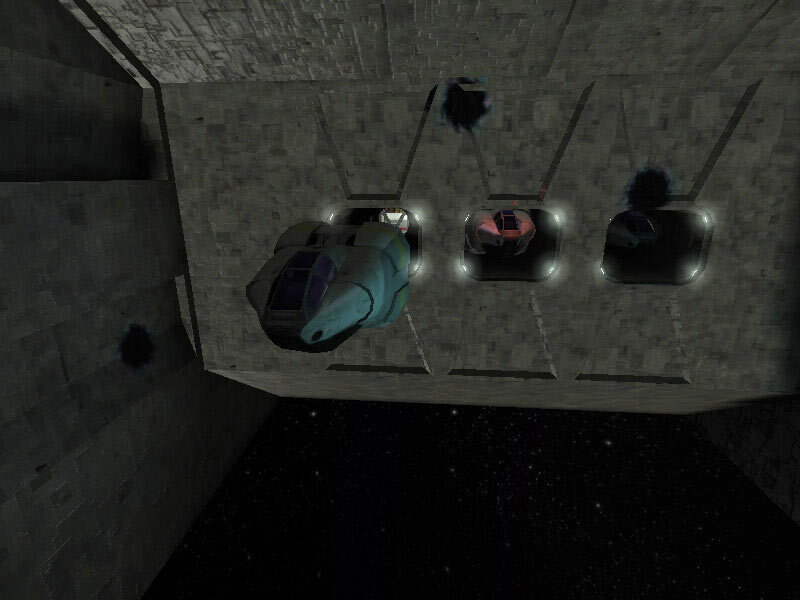 This system was deemed essential for the Autumn's mission into the heart of the Covenant empire; it required 3 direct hits with MAC rounds to disable the energy shielding of most large Covenant space vessels. The Autumn's MAC munitions were light rounds of an outer layer of tungsten carbide concealing a ferrous core. Each round was 30ft in length and about 5ft in diameter. These MAC rounds were designed to splinter on impact. The MAC is a forward firing unguided munition. Firing solutions had to be properly worked out and rechecked before launching the MAC round to avoid a wasted shot. The Autumn carried a standard complement of three Shiva nuclear warheads. These could be deployed as ship-guided munitions, but more often were used as ordnance packages for the Longsword single ships normally carried on cruisers as auxiliary fighter craft. Not so much a weapon as a defensive feature, most UNSC ships had thick armor plating to help absorb physical projectile impacts, ships collisions, and to help dissipate energy weapon blasts from Covenant ships. The Titanium-A armor plating on the Autumn was formidable, however is considered light compared to more modern cruisers. The Autumn's special internal framework counteracts this deficiency. 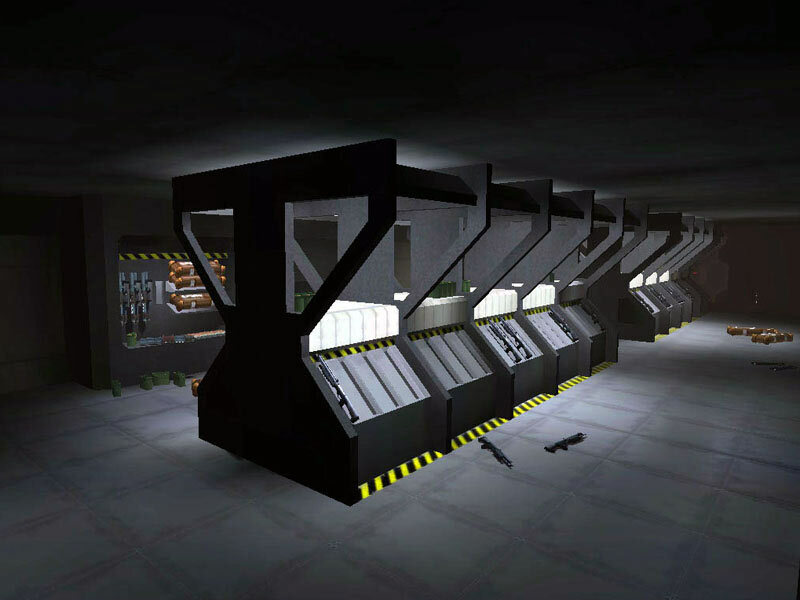 Distributed throughout the ship were weapons storage areas. 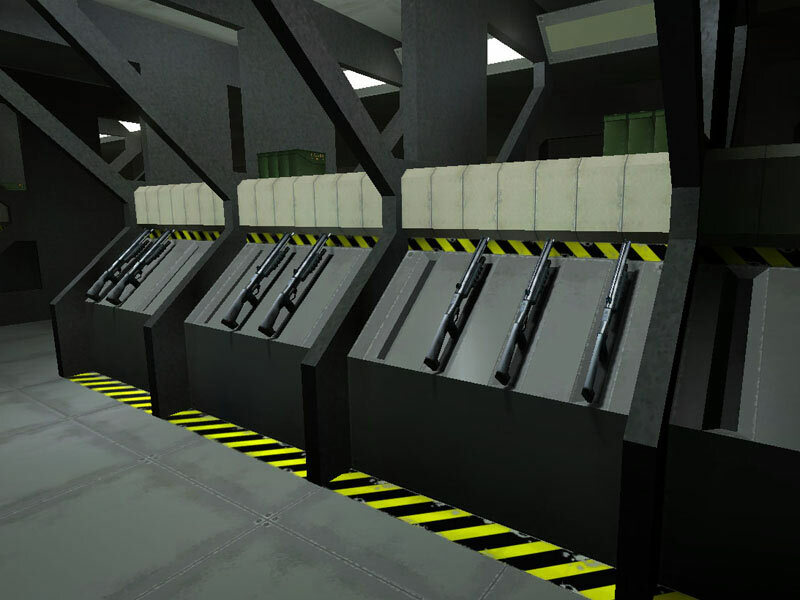 These compartments contain wall-mounted heavy weapons lockers around the armory's periphery with a double central aisle of firearm storage for rifles and shotguns. 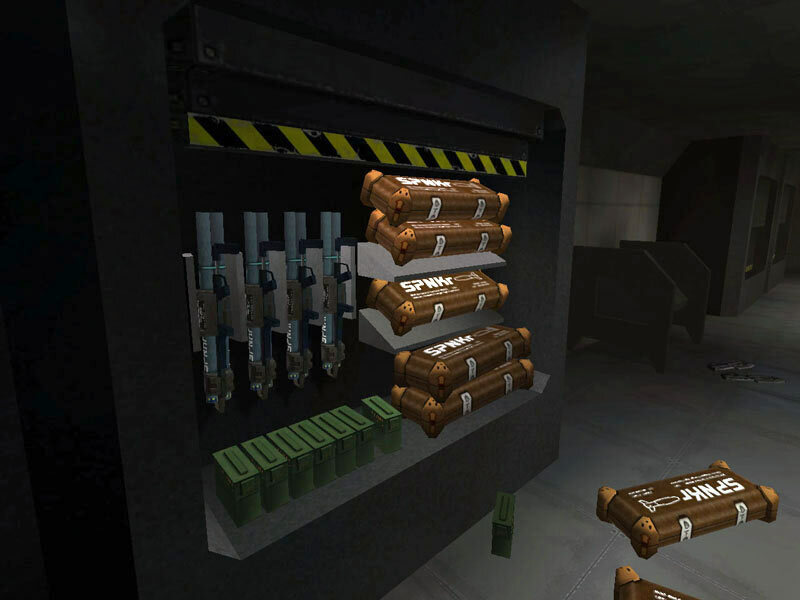 Ammunition for the heavy weapons was stored alongside them in the slide-open wall lockers. Ammo packs for the rifles was stored alongside them and shotgun shells were in cases on shelving above the central aisle. All weapons were stored without ammunition according to ship's regulations. 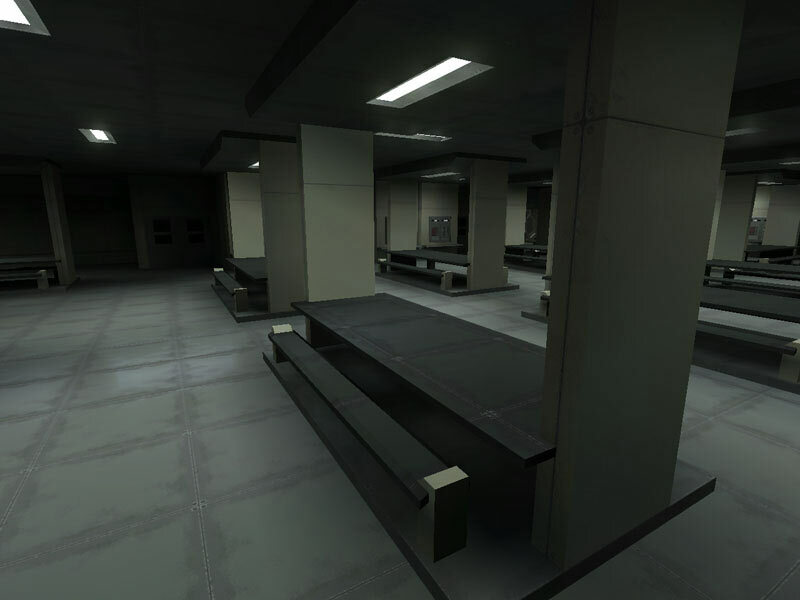 In addition to the dedicated armories, there were standalone racks for weapon and ammunition storage located in key corridor sections. They were only normally stocked during alert conditions or missions with a high probability of shipboard combat (such as boarding action scenarios). 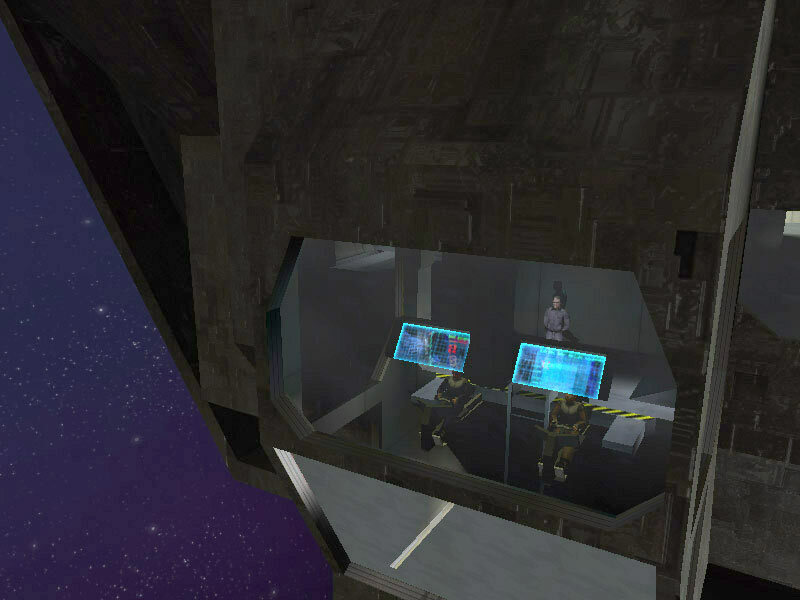 All UNSC ships incorporate an auto-destruct system to prevent the capture of UNSC technology by rebel factions or to preclude the possibility of the Covenant learning about UNSC technology and tactical/navigational information such as colony world locations. Only the Captain of a vessel has the proper authority to activate a ship's self destruct sequence. 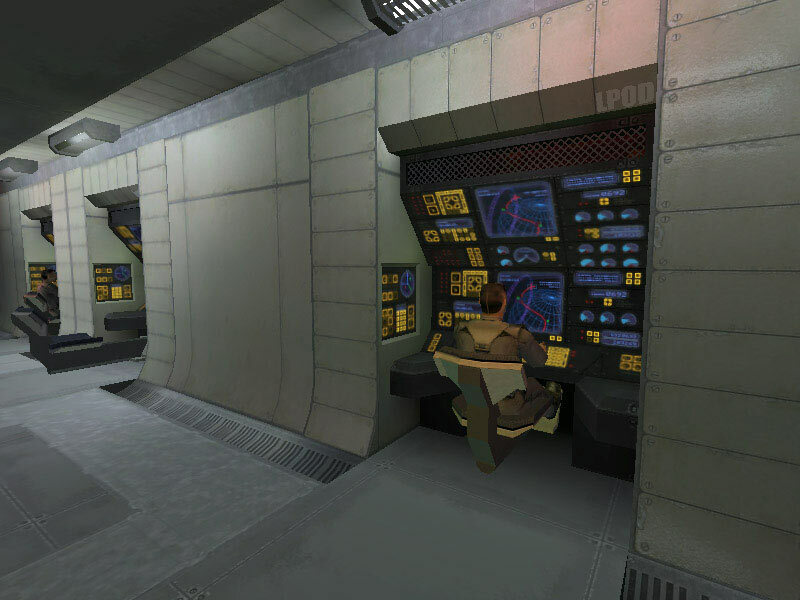 The command codes were not stored in the ship's computer data banks, but were only stored within the commanding officer's neural interlace. 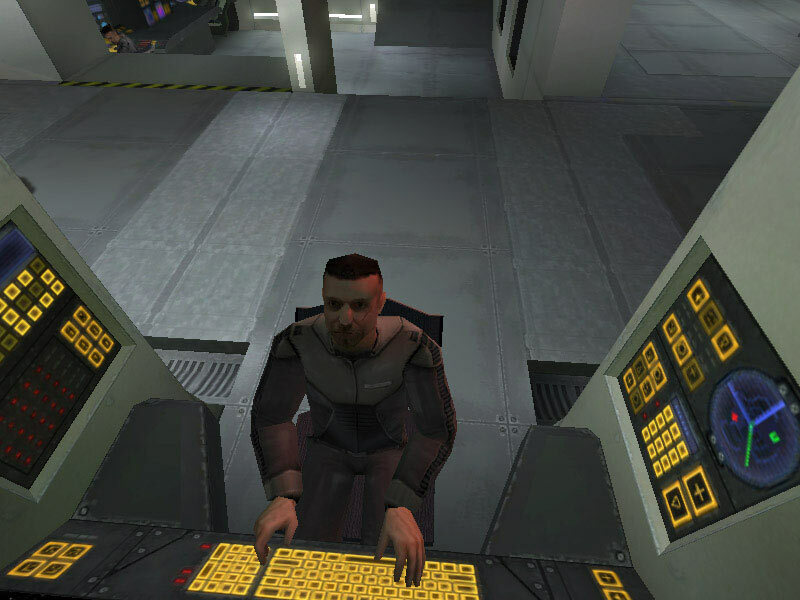 In the event the captain is killed during a mission, the computer would know to accept such a command from the next officer in the chain of command, and so on. The appropriate command codes would be file-unlocked in the next officer's neural interlace at that time. 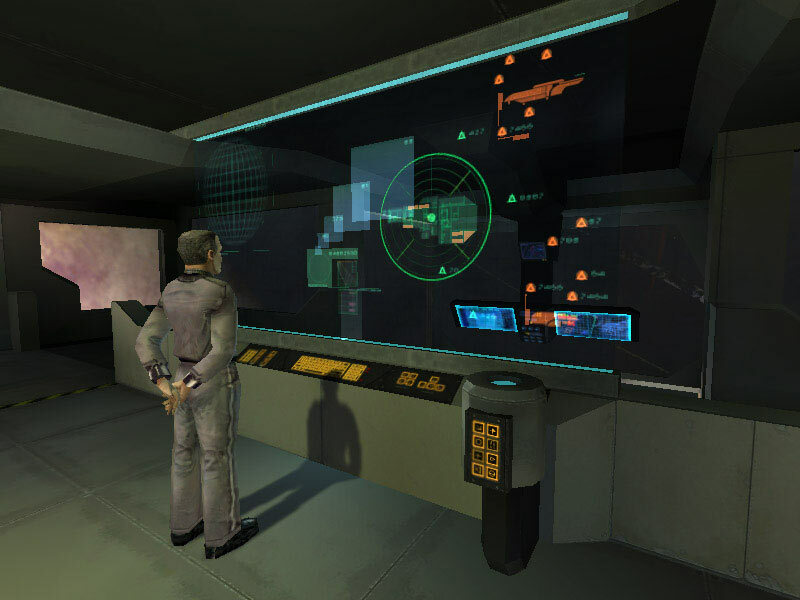 An AI, although linked to the computer, cannot independently activate a ship's self-destruct without the commanding officer's command codes. Standard procedure for self-destruct scenarios calls for a check of certain security protocols. Once those protocols have been verified as accomplished, evacuation procedures can begin for all personnel. Only key primary systems remain online during this procedure. All backup and tertiary systems were shut down. 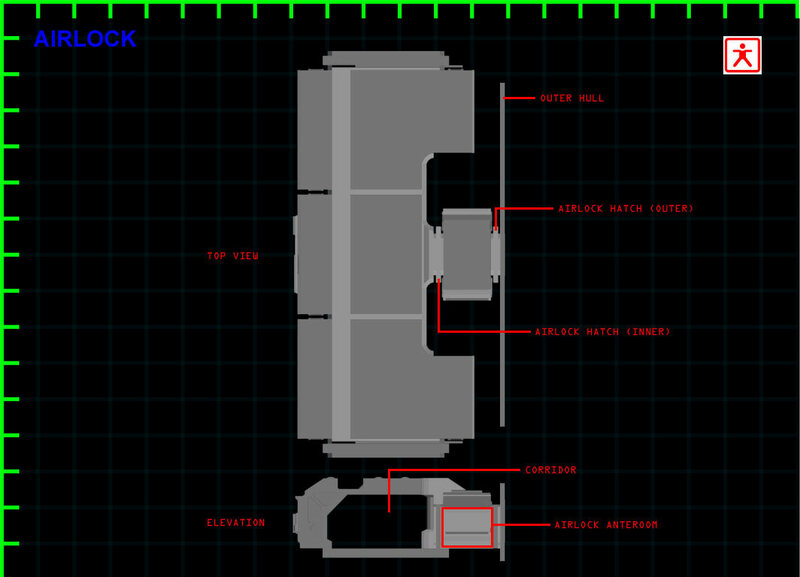 The destruct timer is set by default to the minimum safe distance the crew can reach prior to spacecraft destruction. 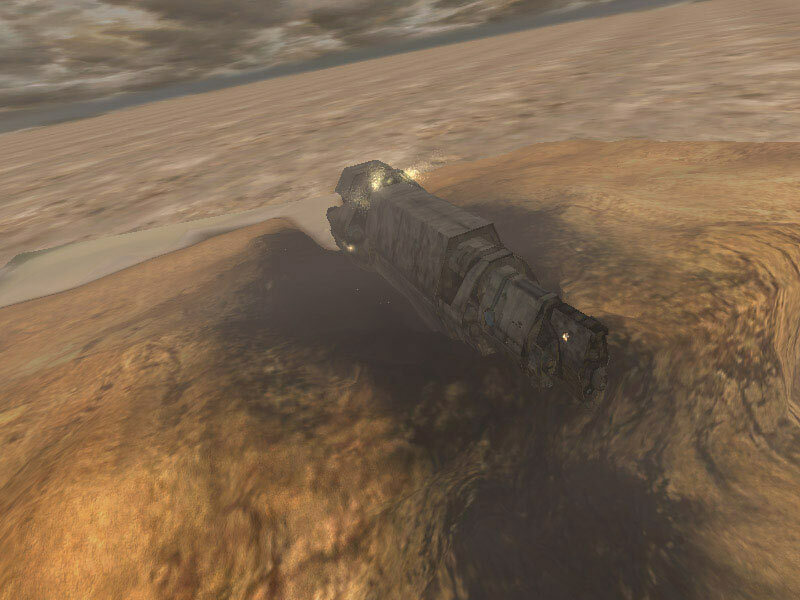 This actual time is determined by the computer or AI and can vary in length; if the crew escapes the ship in lifepods in deep space, the time would be shorter than if the ship was crashed on a planet and crew escape had to be accomplished via ground vehicles. Many factors are worked in to the 'minimum safe distance' equation. For security reasons, the maximum time set would be no greater than a standard hour, or more precisely, 59 minutes and 59 seconds whether that constituted 'minimum safe distance' for the crew or not. 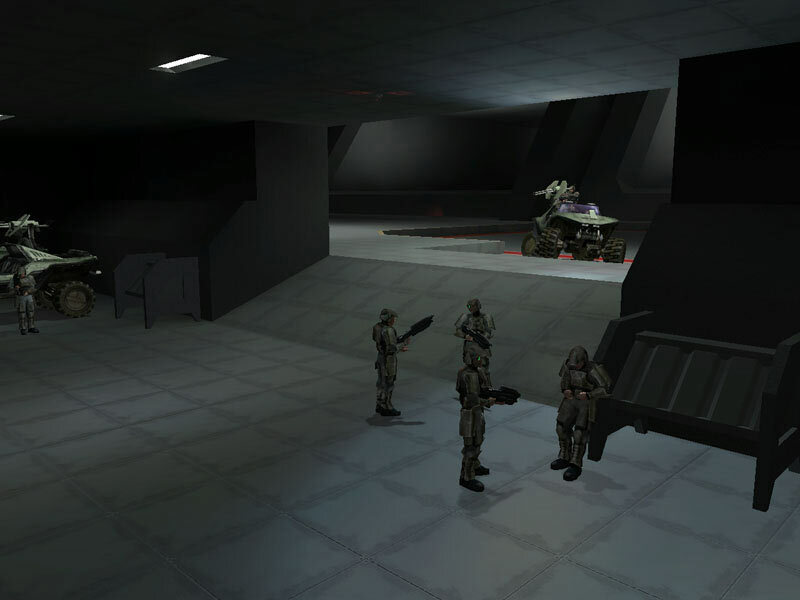 Military technology could not fall into the hands of rebels, and after the conflict with the Covenant, no UNSC technology could be left intact for capture. Crew quarters aboard the cruiser were plentiful. Officers were assigned a cabin to themselves. Enlisted crew shared cabins. 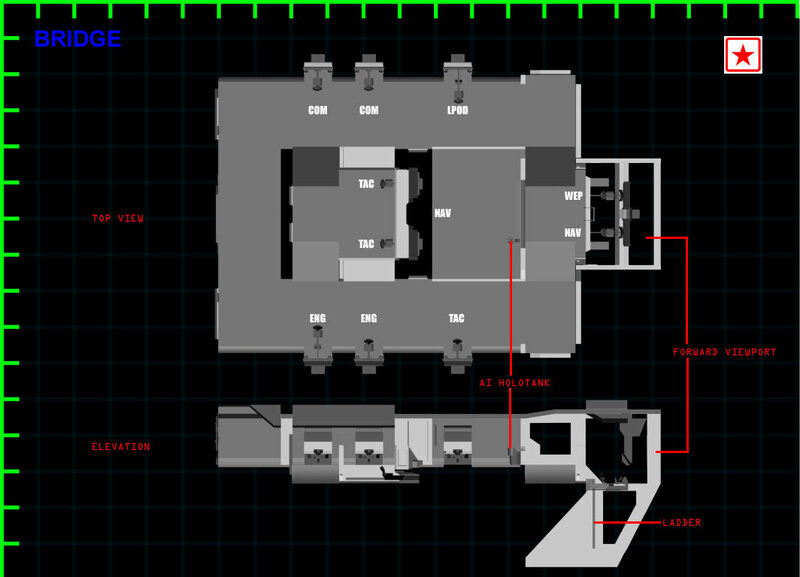 Several cabins were held in reserve for situations like colony rescue needs, VIP passengers, etc. 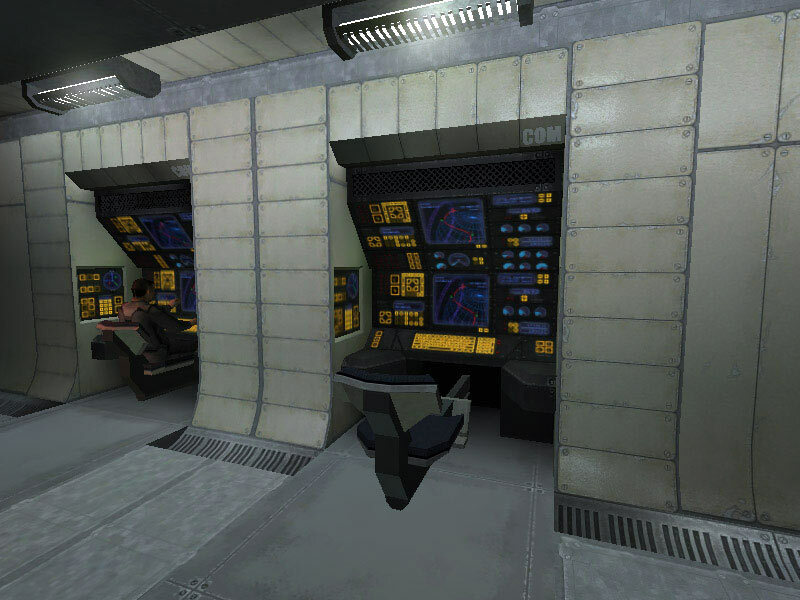 A Sickbay that acted as a general infirmary for treating all sorts of medical conditions to full surgical suites with flash-clone tanks was present to accommodate the medical needs of the crew. Dedicated labs for medical/pharmaceutical research were located nearby. In addition to the Sickbay, medical packs and aid stations were scattered about the ship for localized help should the need arise. Food service on a Halcyon-class cruiser was a mainly automated system, but a chef and full-service galley was also available to meet the entire crew's needs. Automated mess halls, such as the compartment directly aft of the bridge, provided ample bench seating for several crewmembers, and food and beverage stations surrounding the perimeter of the mess hall. The dispensers were stocked via internal conveyors from the galley. Refuse was collected in slots at the dispensers for material recycling. 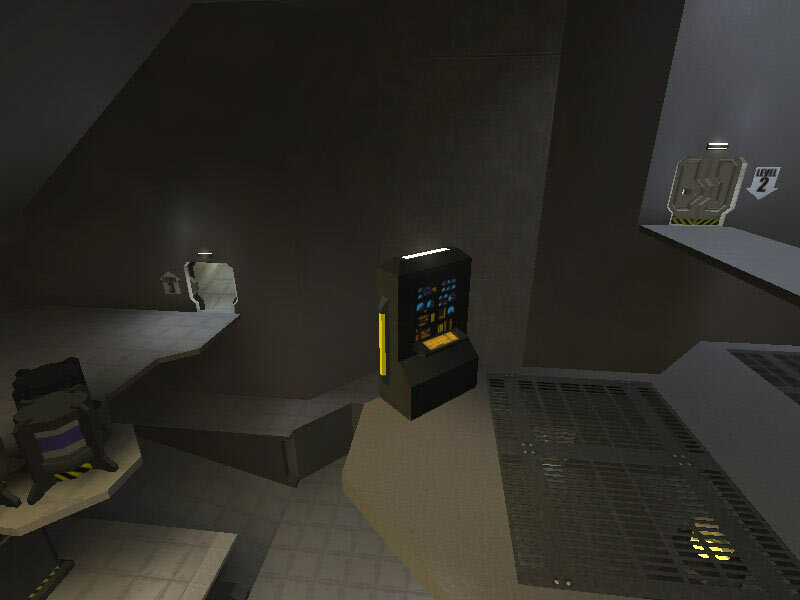 Several standalone beverage dispensers were also located in various corridors throughout the ship. Benches and refuse recycling chutes were on hand at the stations just as in the mess halls. 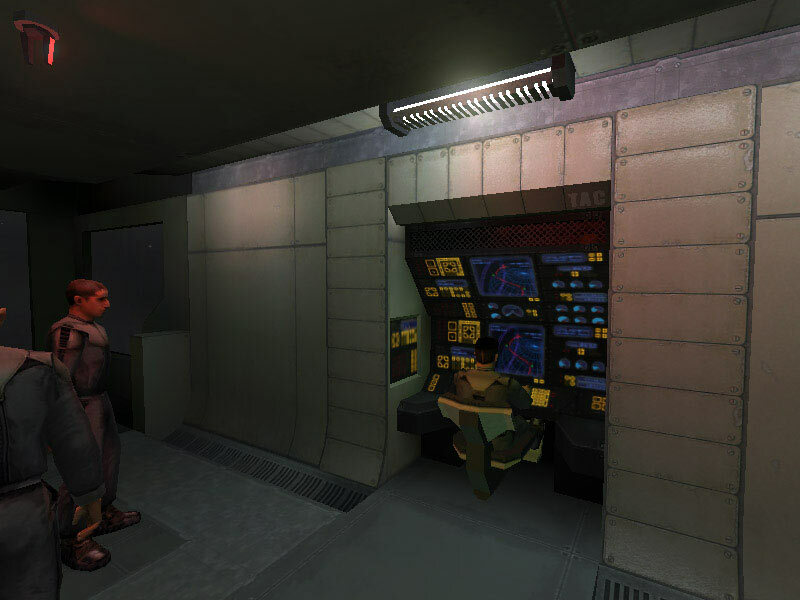 There are extensive cargo and storage facilities on board a Halcyon-class cruiser. 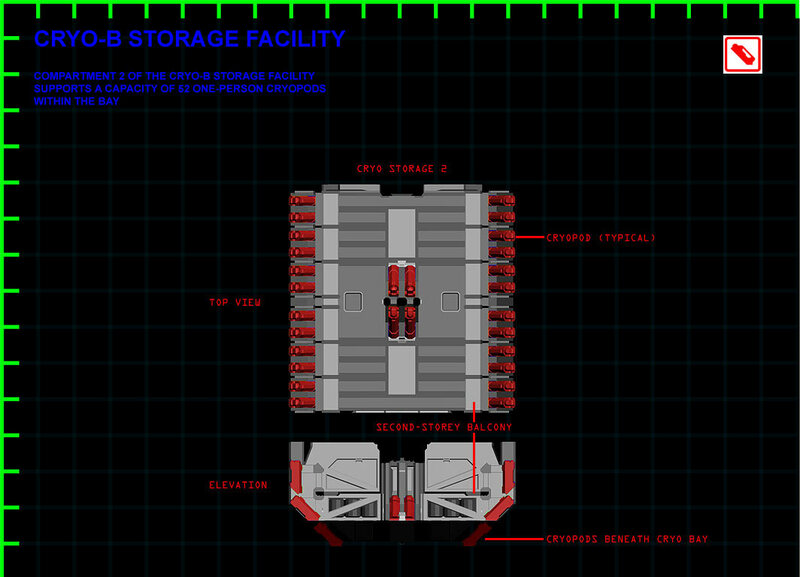 Container and crate storage are often found in compartments similar to the bays modified for cryopod storage. Larger facilities for heftier cargo with dedicated conveyance and crane systems can be found off dorsal service corridor junctions. 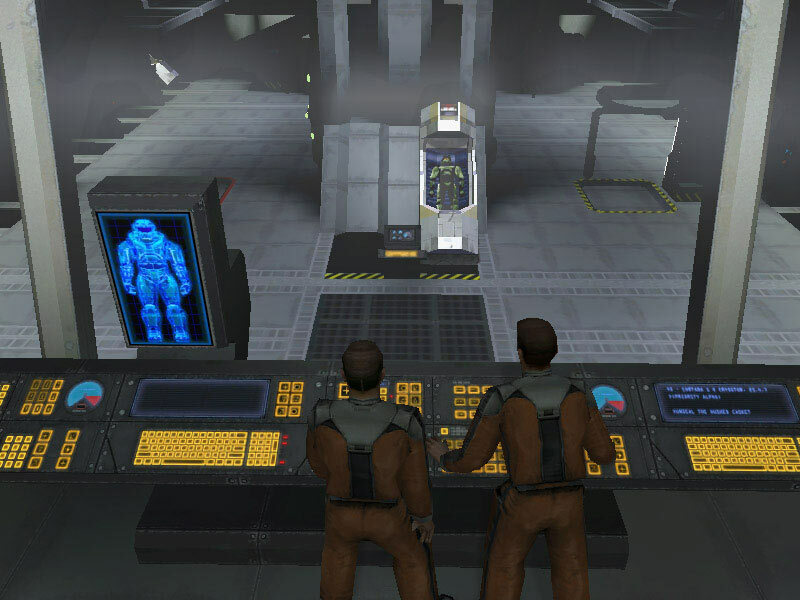 As average travel time between UNSC colonies can take months, during Slipspace flight, a ship's crew generally travels in cryostasis. 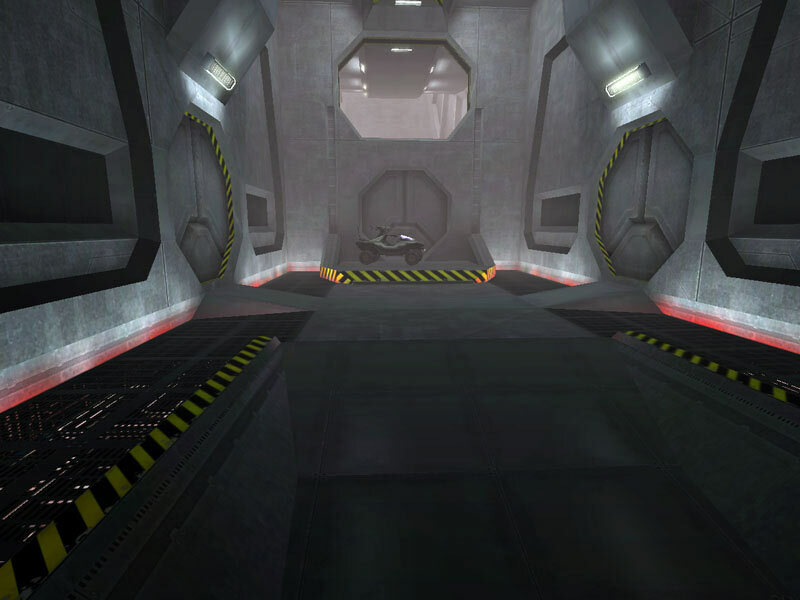 The cryo chamber facilities on board store the cryopods in which the crew remain in stasis until arriving at their destination. These can be extensive facilities depending on how many crew are assigned to the ship. 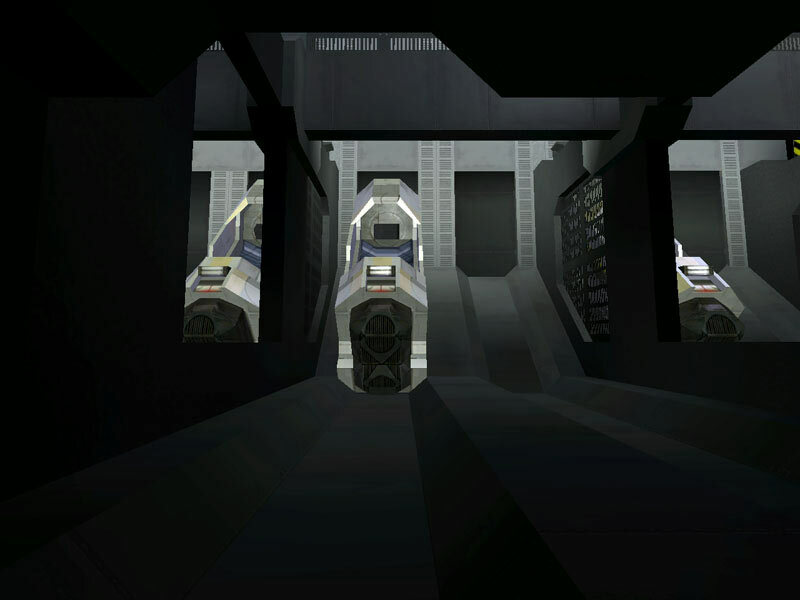 On Halcyon-class ships, a typical cryo-storage facility, such as Cryo B, is a two-compartment arrangement composed of Cryo Storage Unit 1 (Cryo 1) and Cryo Storage Unit 2 (Cryo 2). Observation theaters overlook each bay and contain monitoring equipment. 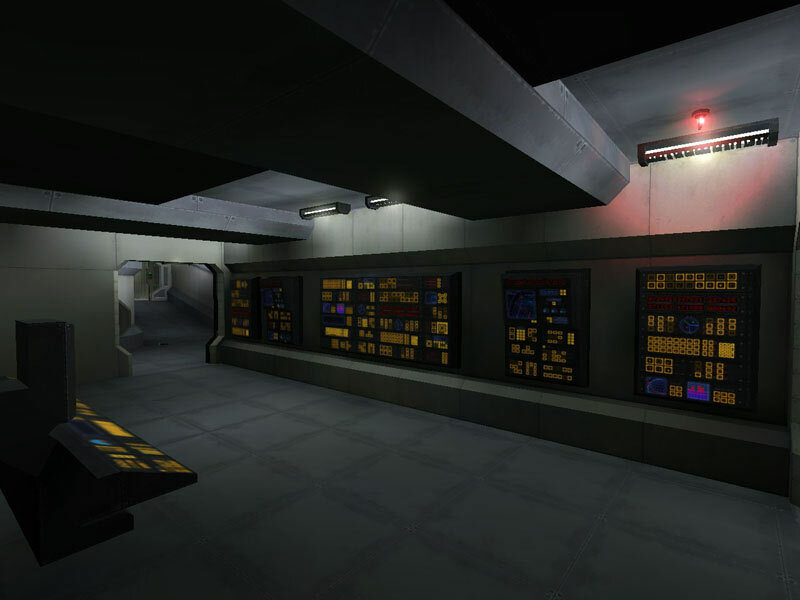 These maintenance control rooms are on the upper level of the two-deck compartments. 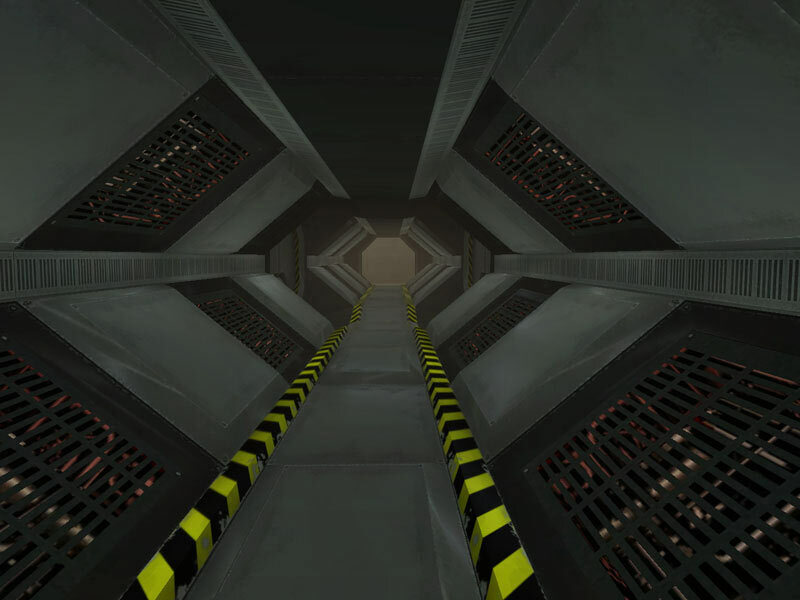 Below each cryopod on the bay's deck is a retractable hatch. 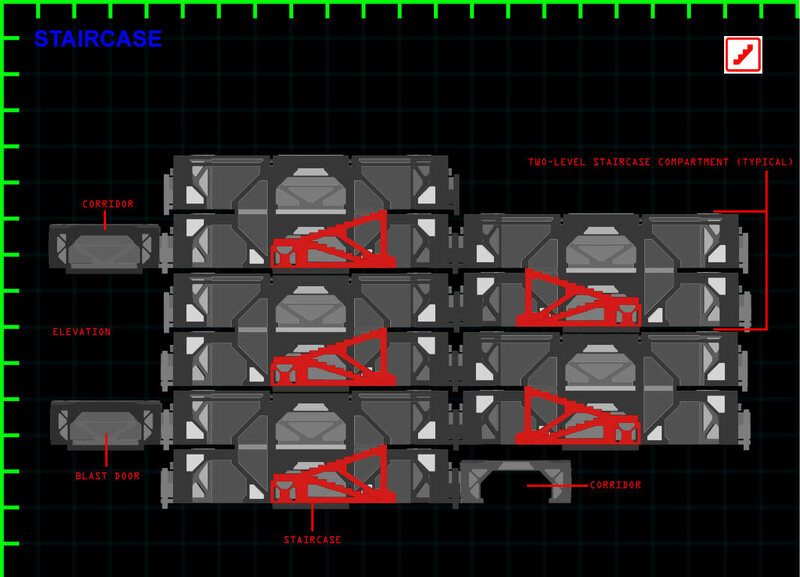 These allow the crypods to travel a route from the cryobay to an exterior ejection hatch on the cruiser's outer hull. Ejection is mandatory for all active cryotubes in the event of a ship-wide catastrophe. 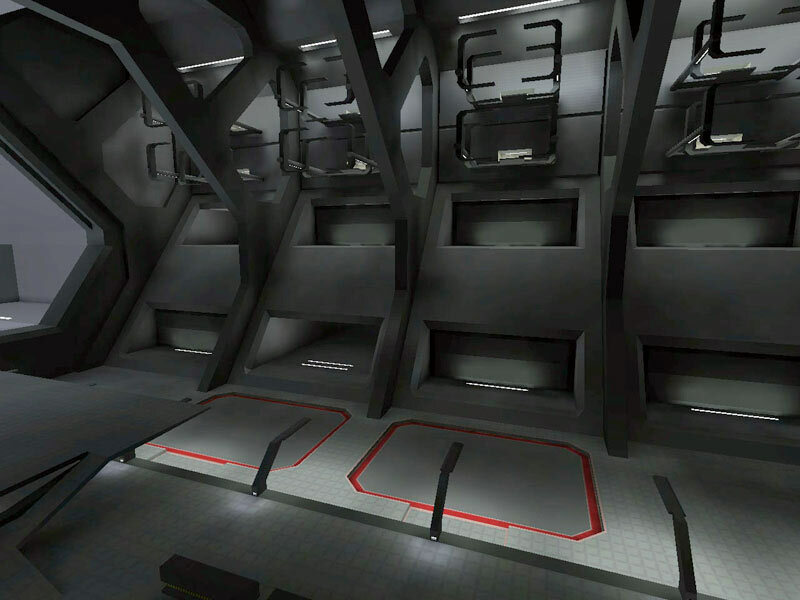 The standard cryopod is a single-occupant, variable-environment, isolation device for crew rest in cryogenic stasis. 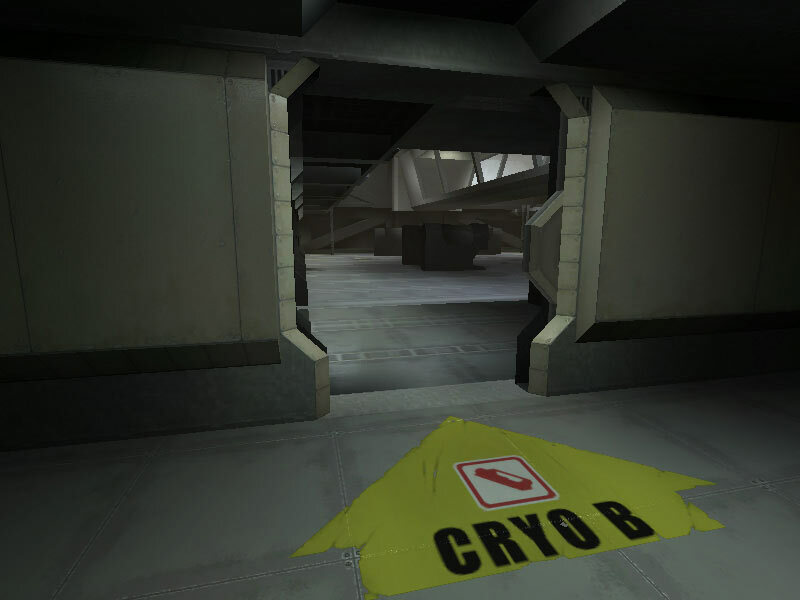 The cryopod is hermetically sealed to protect the crew during Slipspace travel when ship control is handled by an AI or by computer automation. The pod's outer shell is protected by a tough coating of plastasteel. 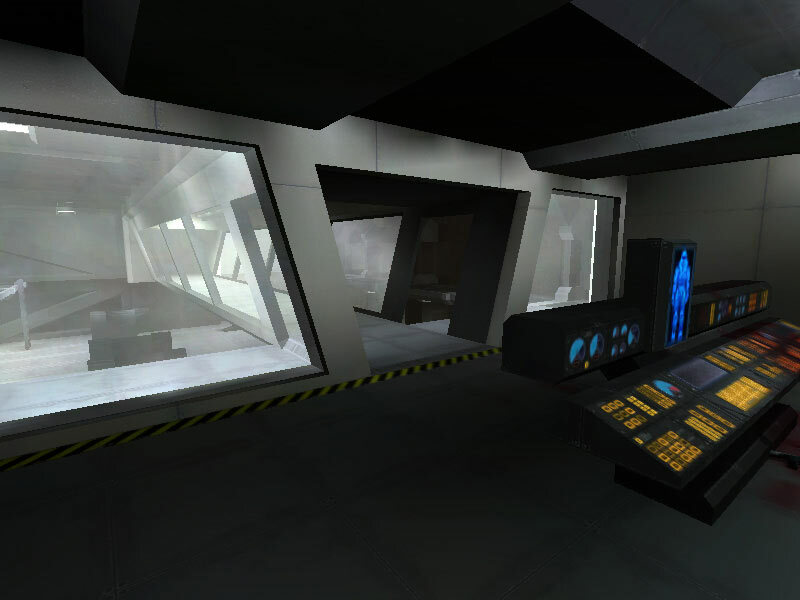 In fact, the overall exterior of the cryopod is similar in construction to the hull of a Bumblebee lifepod. It is standard ship procedure to jettison all active cryopods in the event of an evacuation. If cryopods are ejected with an occupant into space (such as during evacuation operations), thruster and power packs can be affixed to the aft section of the pods to provide independent power for cryo systems operation and control of the pod's trajectory through a telemetric link with a ship's computer. 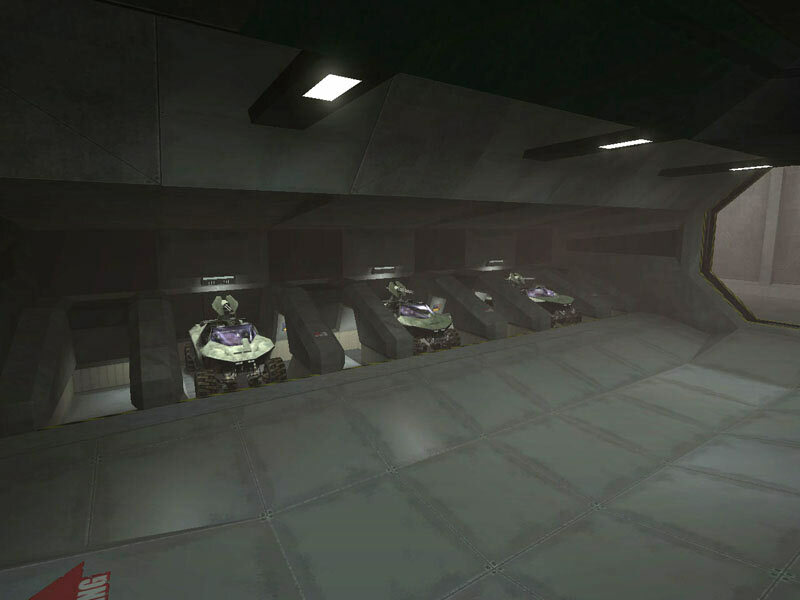 Cryopods can be affixed side by side for minimizing storage requirements, or during the aforementioned emergency operations to keep the pods in proximity. 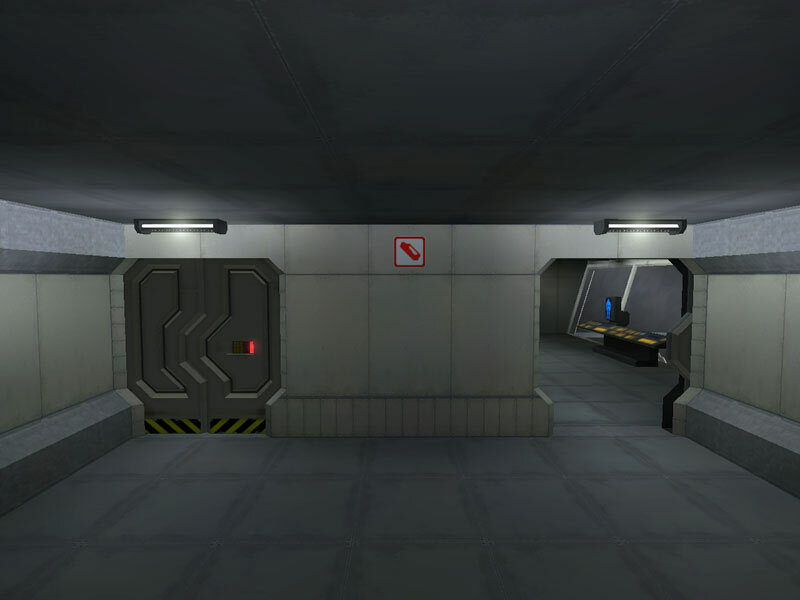 Airlocks are similar to the lifepod facilities on board ship, but without the lifepod. 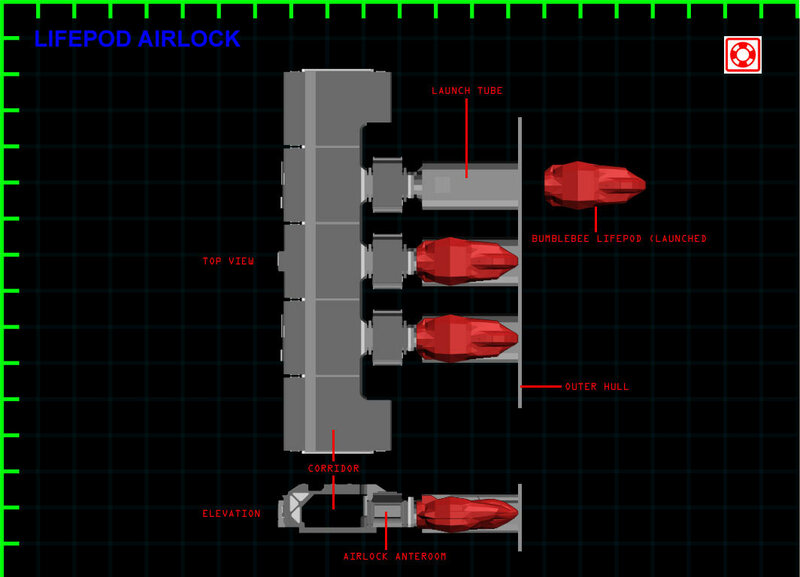 Airlocks provide a passageway between the environment of the ship and the environment of another ship, space station, or even outer space for EVA Ops. 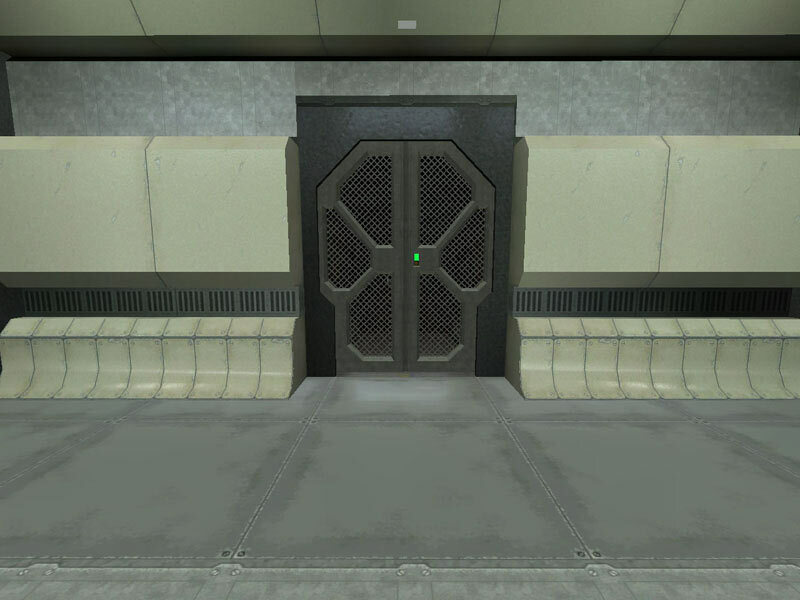 As is typical with airlock systems, the airlock consists of two pressure doors on either side of a variable environment anteroom. 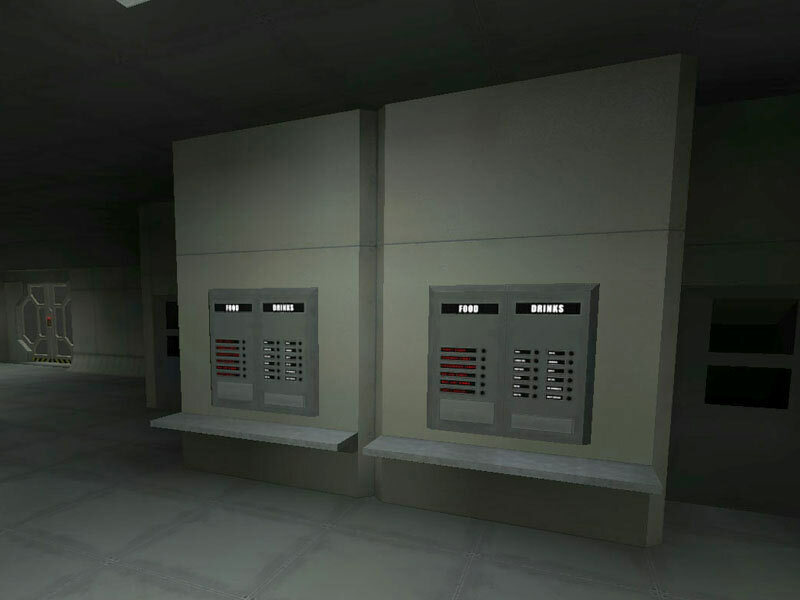 Controls for airlock access are provided in all three areas of the system; the interior, the anteroom, and the exterior. These are carefully key-coded to not allow accidental breach of one environment to the other and for obvious security reasons. 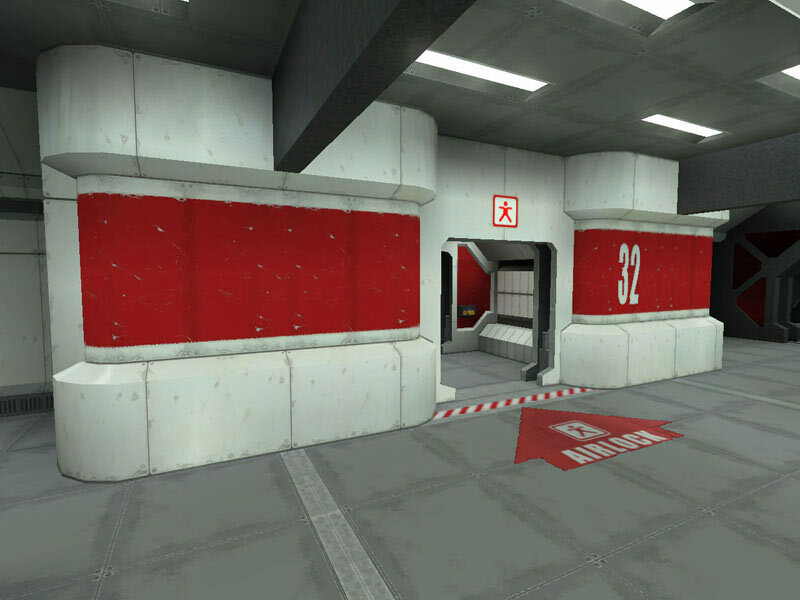 The red markings on the corridor walls in these areas indicate the bulkhead is bordering a pressure differential, such as the vacuum of space. The red warning coloration is standard on UNSC ships and stations. Corridors serve as passageways connecting all crew-accessible compartments on board the ship. 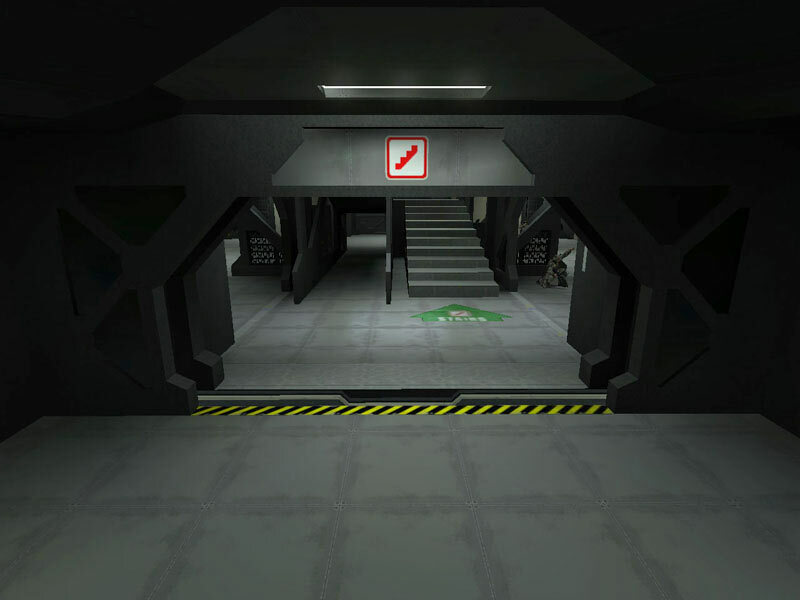 There are several types of corridors depending on intended function or depending on their location within the ship. 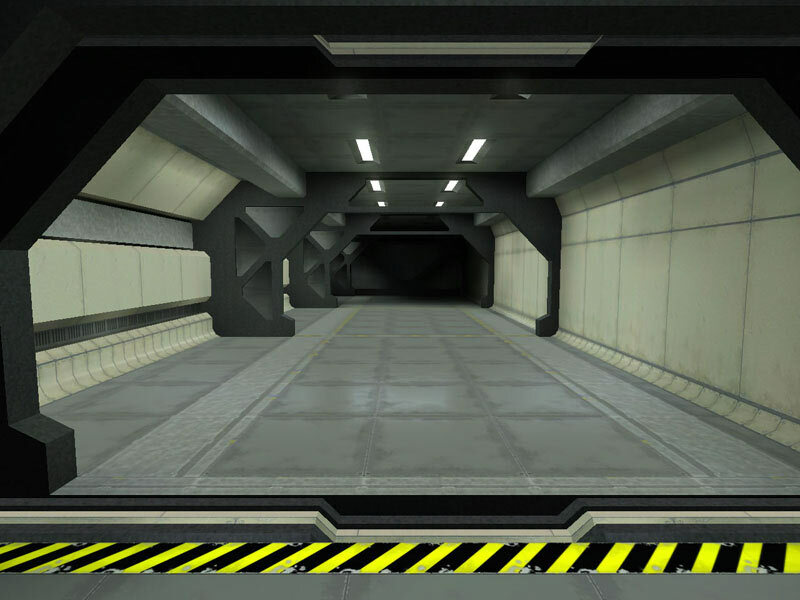 Corridors are modularly constructed components with hatches that can be closed and locked (such as during emergencies). 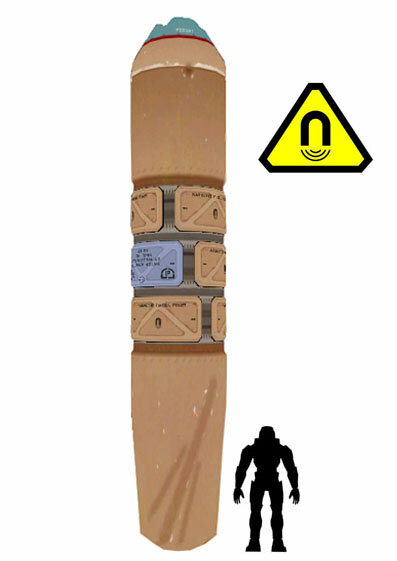 This is beneficial as a safety measure to prevent the spread of atmospheric breaches or to hinder boarding attempts. 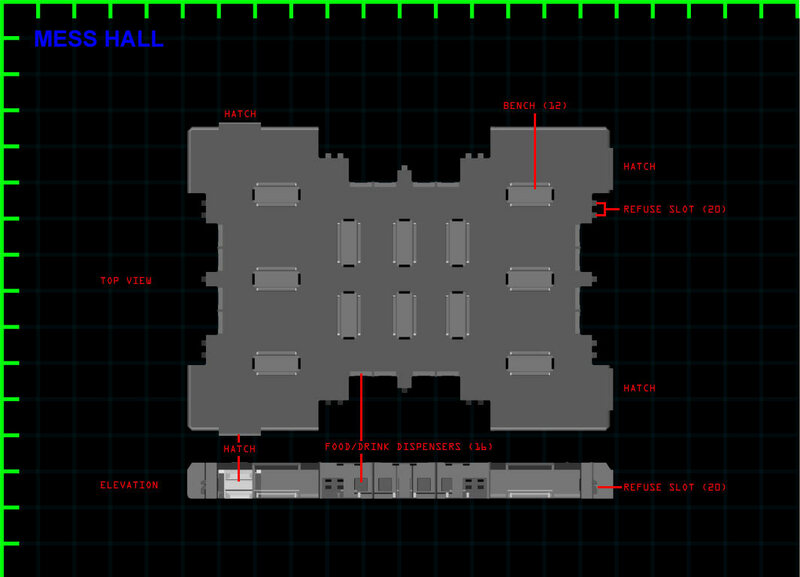 Many corridor hatches that are normally closed open automatically when embedded sensors detect crew presence in proximity to the hatch. Whether a sensor will open a hatch automatically can often be determined by the color of the access panel on the hatch. 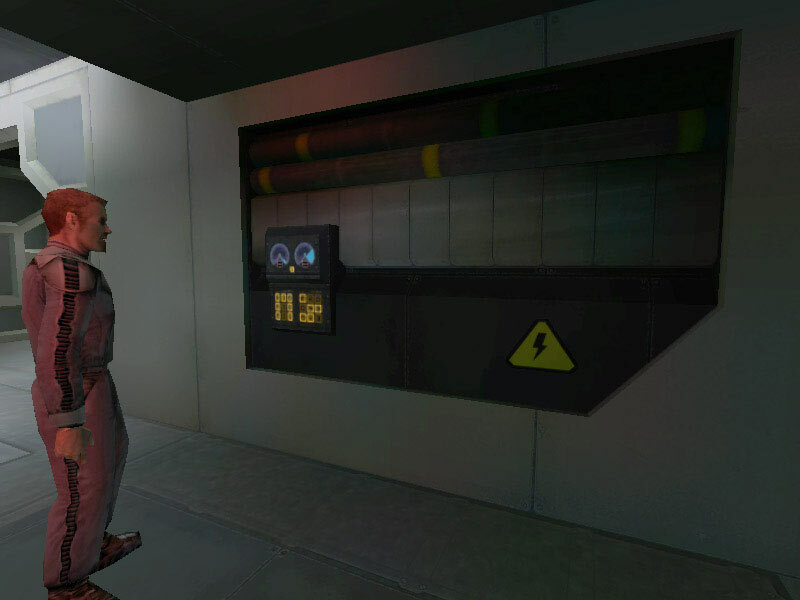 A green light indicates the door is unlocked and will open when approached. 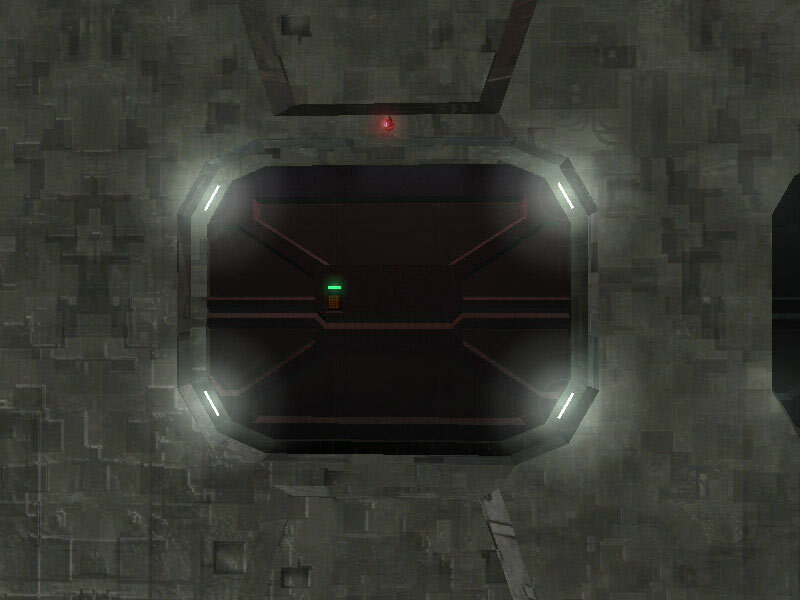 A red light on a hatch panel requires a code to be entered to unlock and open the hatch. 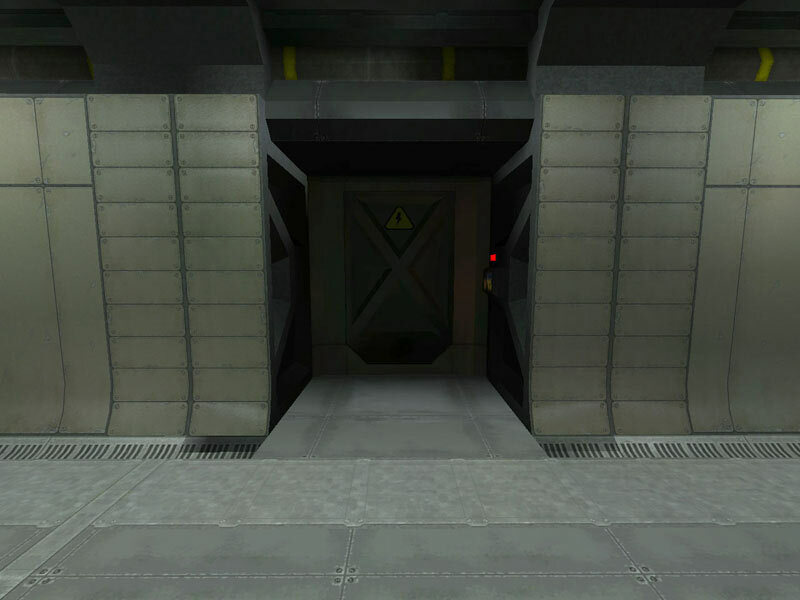 Some larger corridors (especially in proximity to a ship's outer hull areas) have dedicated blast doors better suited to contained explosive decompression breaches. 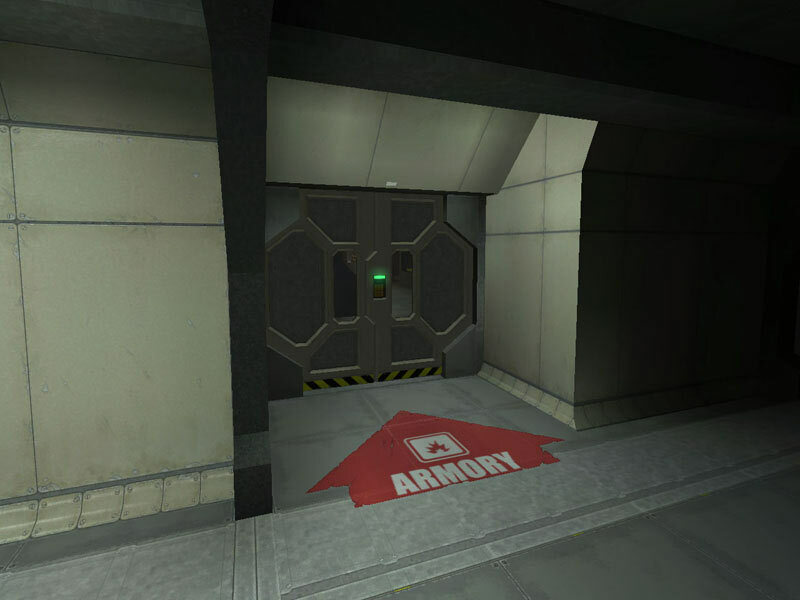 These have horizontally split partitioned doors which close, followed by an outer hatch layer of Titanium-A armor plate on either side of the inner door which also closes floor-to-ceiling. 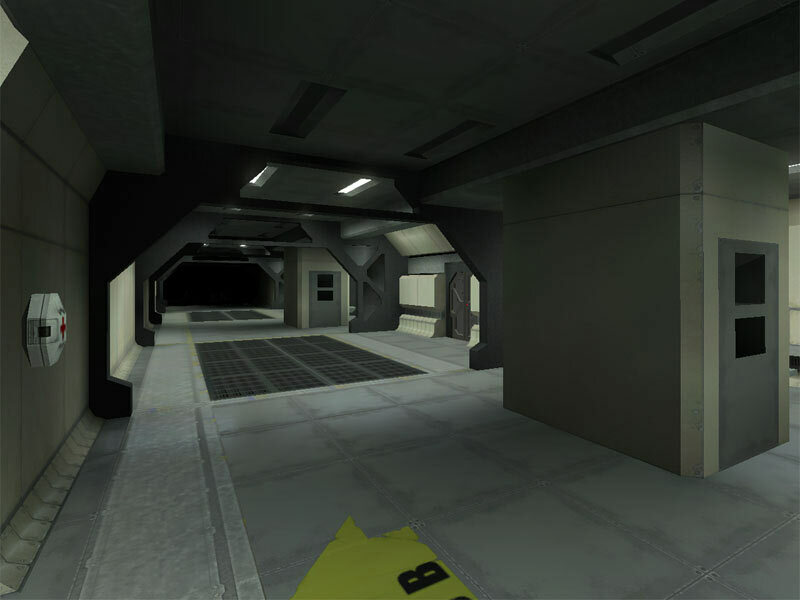 In addition to crew passage, corridors serve many other functions. 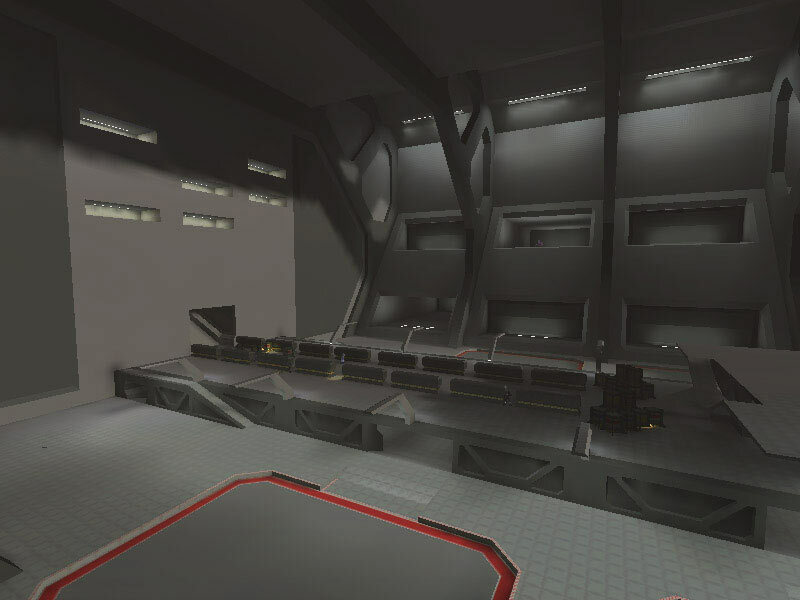 Panels on the sides, floor, and ceiling can be removed to access various service areas. 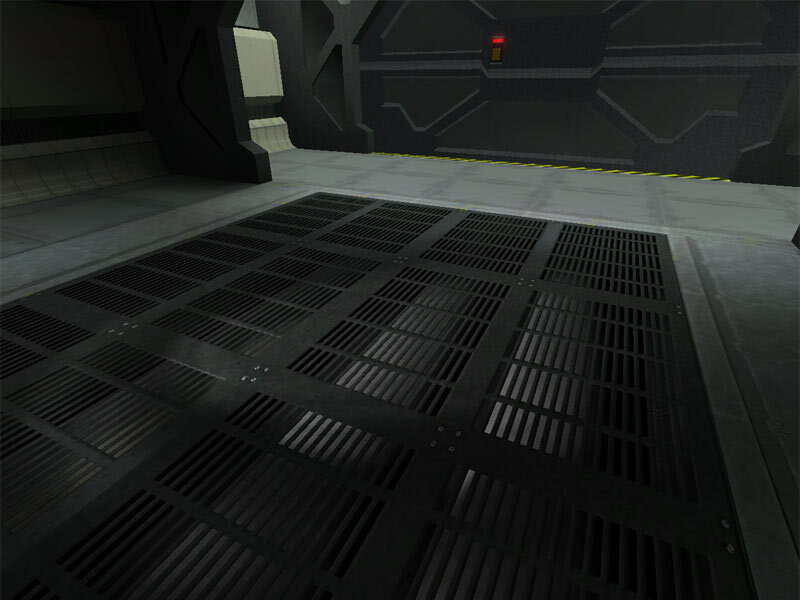 Floor panels provide access to the artificial gravity systems (on ships with that technology). Ceiling panels access systems like corridor lighting, electrical cabling and atmospheric gases piping. 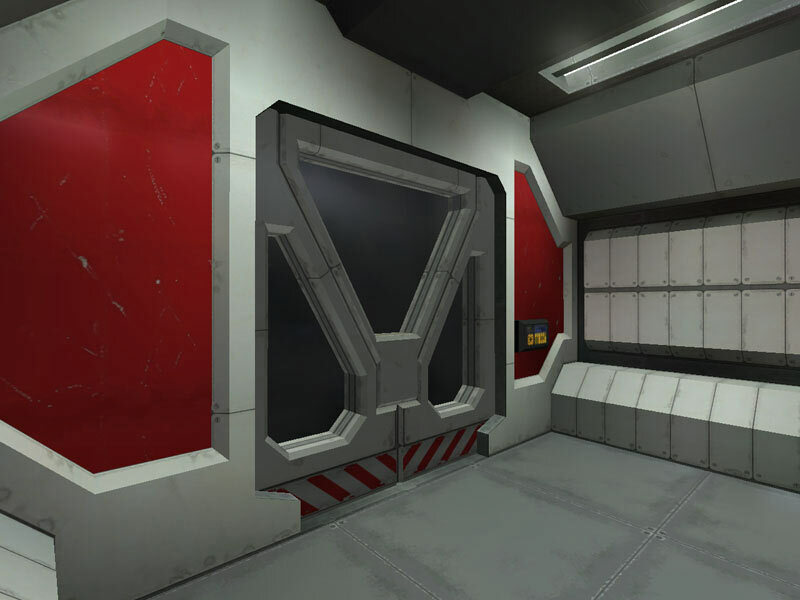 Wall panels remove to reveal storage compartments, electrical trunks, fuel conduits, and other ship maintenance systems. Often running parallel but behind main crew corridors, maintenance accessways are dedicated halls and crawlways that provide dedicated access to maintenance and engineering-related systems. 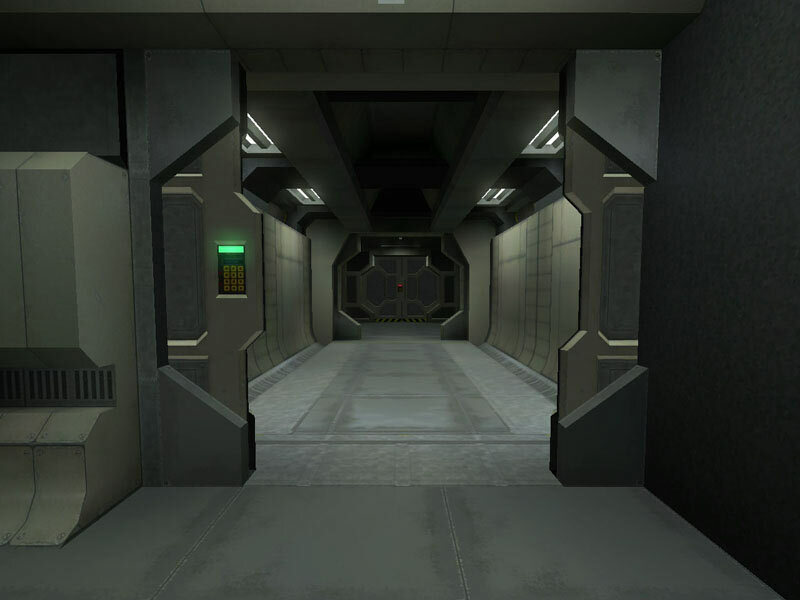 These are typically narrow passages that lead to the inner workings of the ship to provide access to areas not easily reached by conventional corridors or compartments. 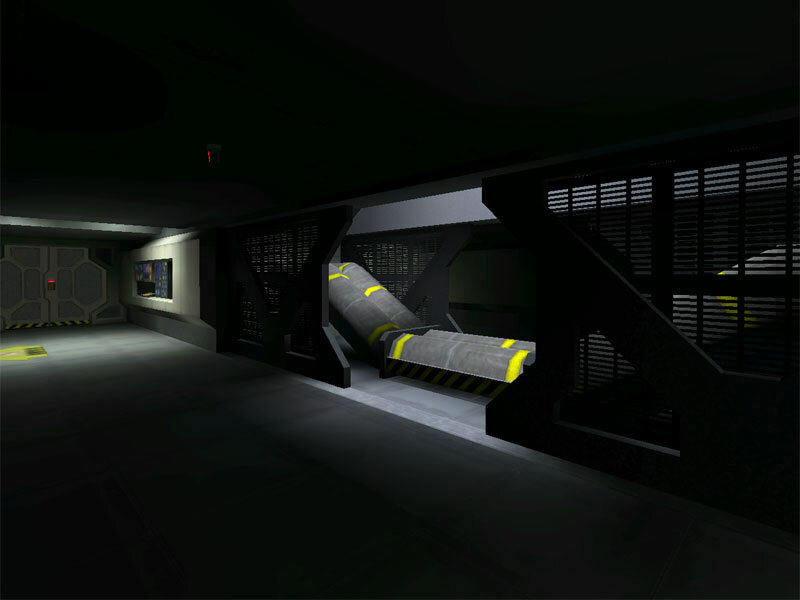 They are not normally fully illuminated like standard corridors until required. These areas also provide an alternate means of deck-to-deck access by means of interdeck ladders. Normally, crew could use an elevator or a staircase, but in the event a staircase cannot be reached or power failure has disabled elevator usage, the maintenance accessways allow the crew to climb or descend a retractable ladder to reach other decks of the ship. 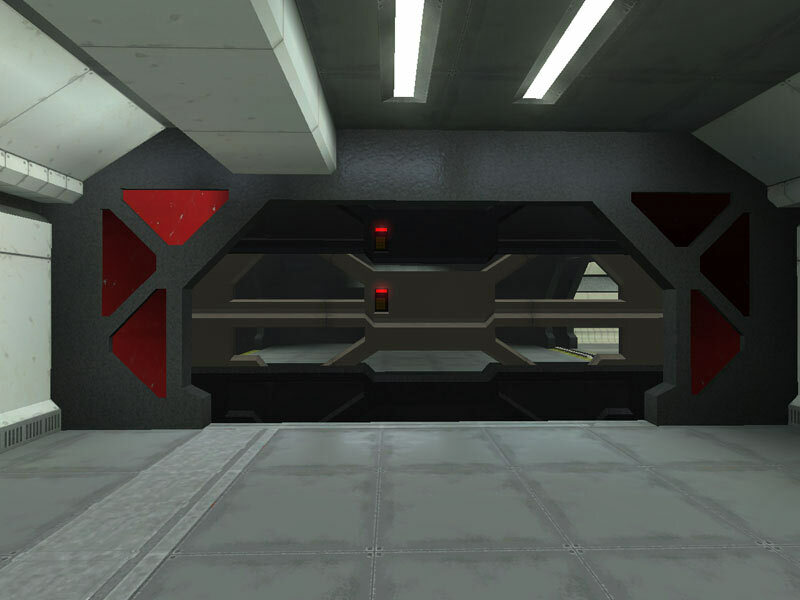 The labyrinthine system of maintenance accessways throughout a ship is as widespread as that of the standard crew corridors; perhaps even more so. 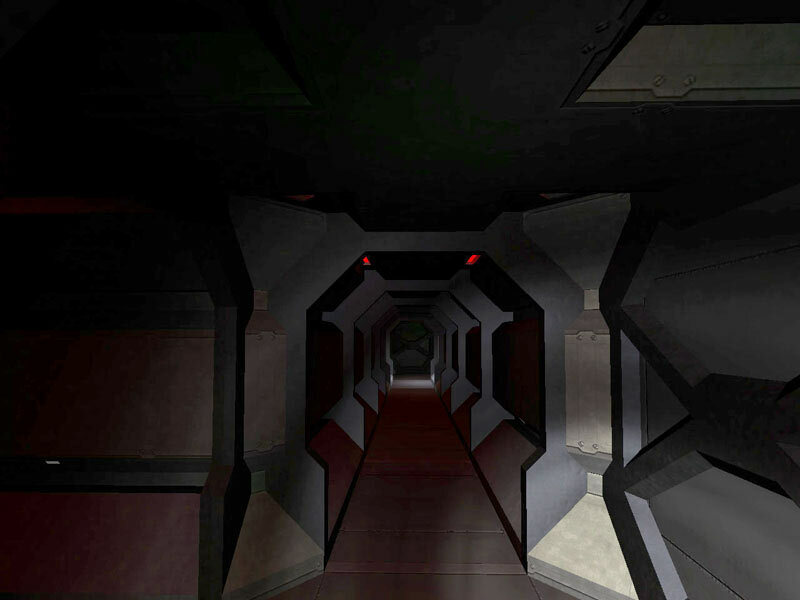 Service corridors, like the Halcyon-class' class-7 service corridor are voluminous spaces that run the length of the vessel and branch off into key areas. They're intended for cargo conveyance mainly, being wide and high enough to accommodate even vehicles. 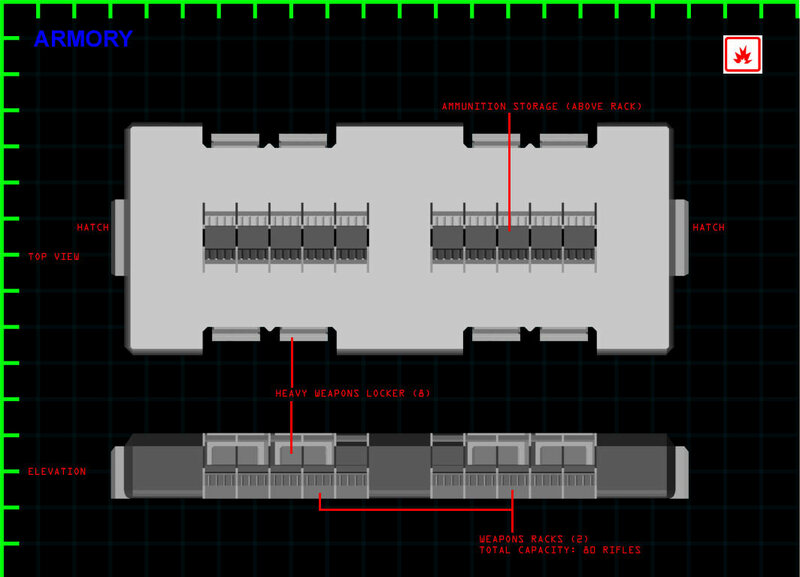 In some cases, the service corridor junctions have overhead retractable panels that allow access from space to cargo areas of the ship for zero-G loading/unloading of bulk goods such as during a shipyard layover. 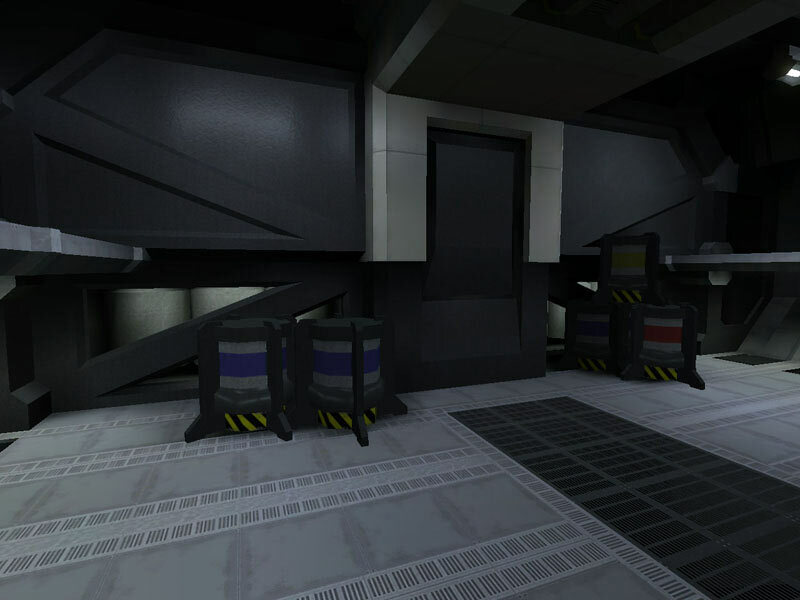 Elevators provide vertical access across the various decks of a ship. Personnel lifts can hold several individuals. Hatches are similar to any other corridor hatches in that they automatically open and close via proximity detection sensors. 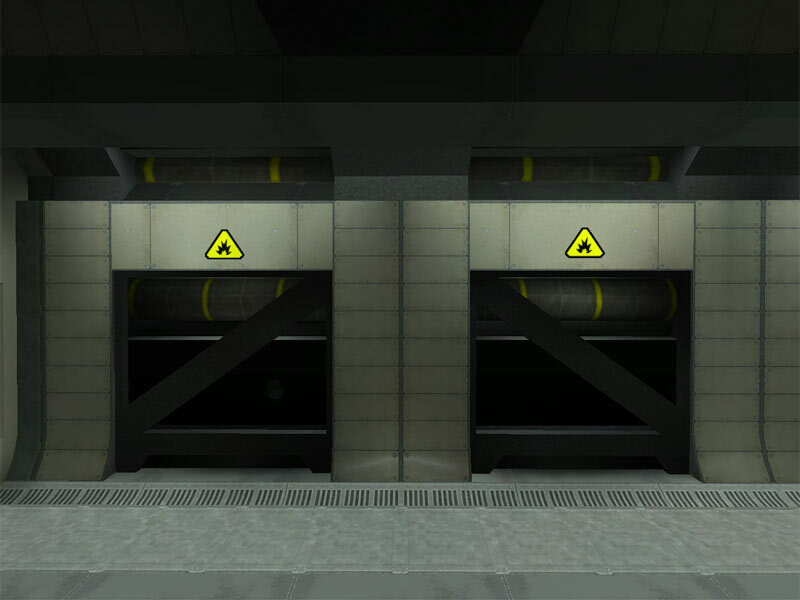 Cargo elevators operate in much the same way, but are simply larger in size. They are built to accommodate cargo and small vehicle transfer between decks. 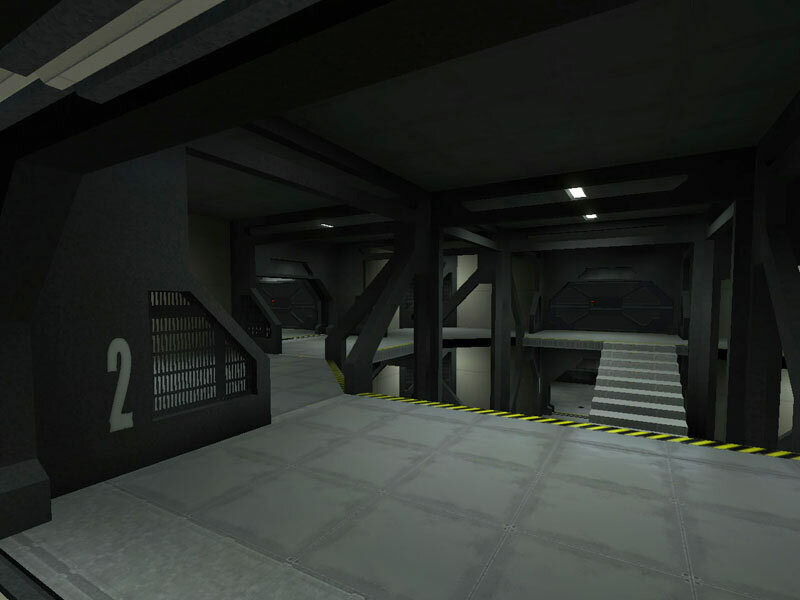 Larger vehicle lifts ferry recon vehicles and tanks within hangar bays. 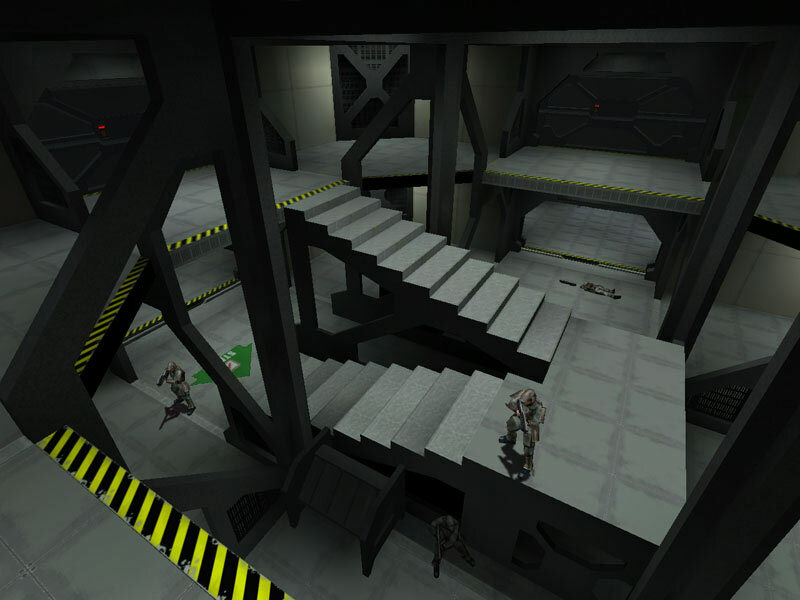 Stairs are provided throughout the ship as a redundant means of accessing the various decks of a ship. In many cases, stairs are found to only facilitate transfer between two decks at a time. Staircase sections are staggered one compartment away from the next. This is for mainly safety reasons, but has security applications as well. 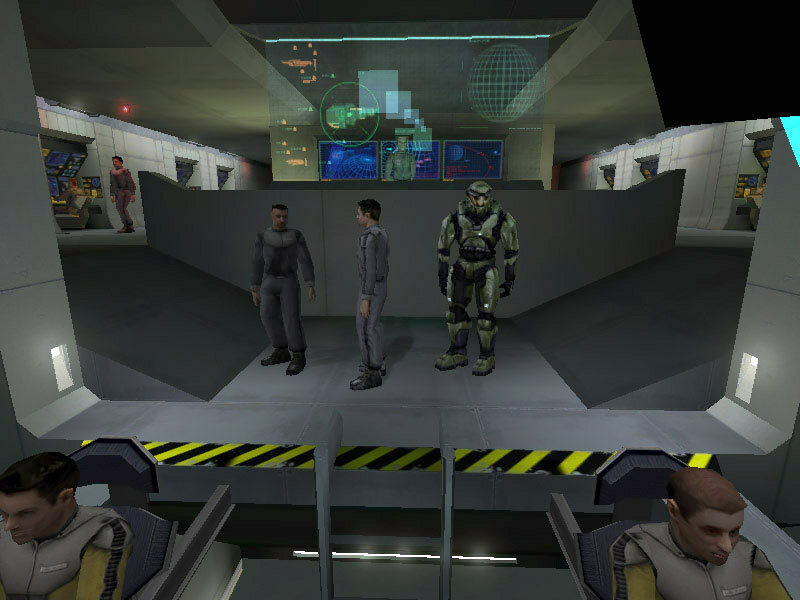 During combat or some other emergency, if the ship's attitude were disrupted, crew in a stairwell could fall before the ship was stabilized. As a safety measure, if a crewmember fell down the stairs, at most they would fall from one deck to the next below. Although an injury could occur, it wouldn't be a surely-fatal plummet from several decks in height. 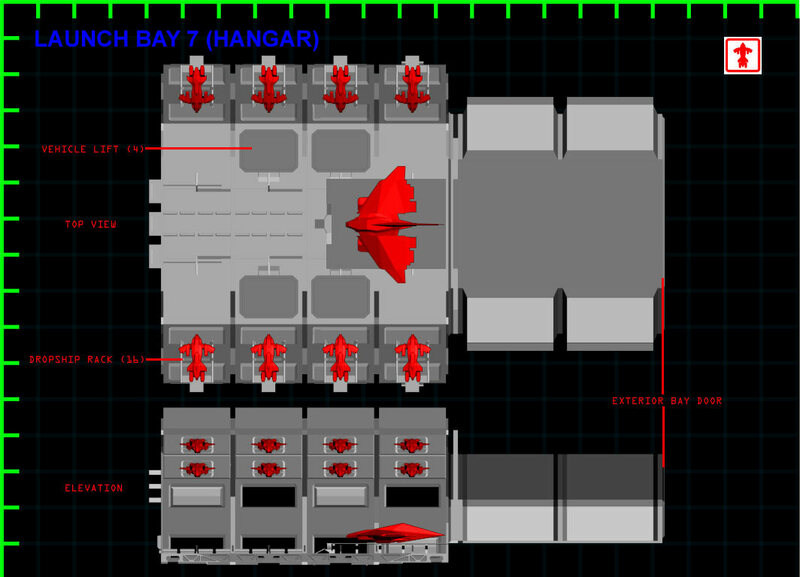 UNSC ships that carry auxiliary craft on board such as fighters and dropships have comprehensive hangar facilities to accommodate docked craft for storage, maintenance, refueling, and munitions/cargo loading. 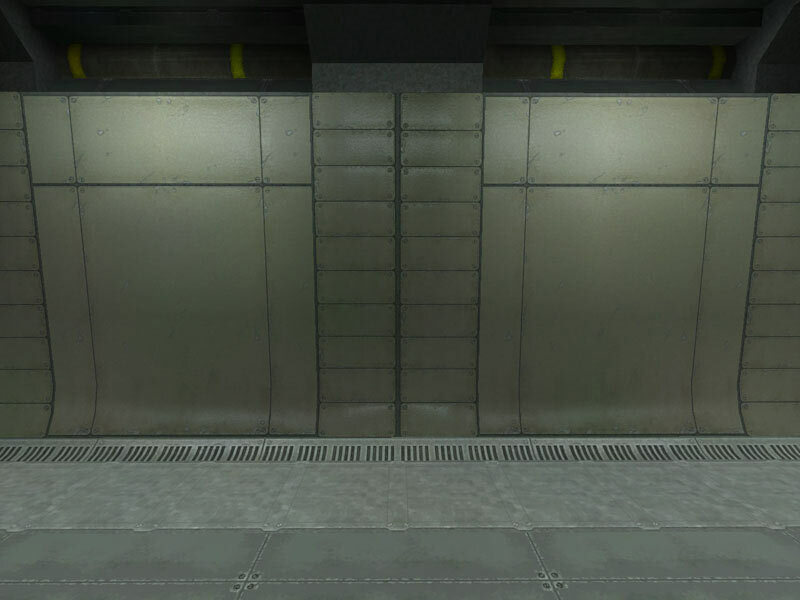 The Pillar of Autumn has several launch bays but the largest is Launch Bay 7. It features docking berths for sixteen Pelican dropships, a landing platform for a Longsword fighter, and access to ground vehicle garages. The communications center is nearby which housed all comm. 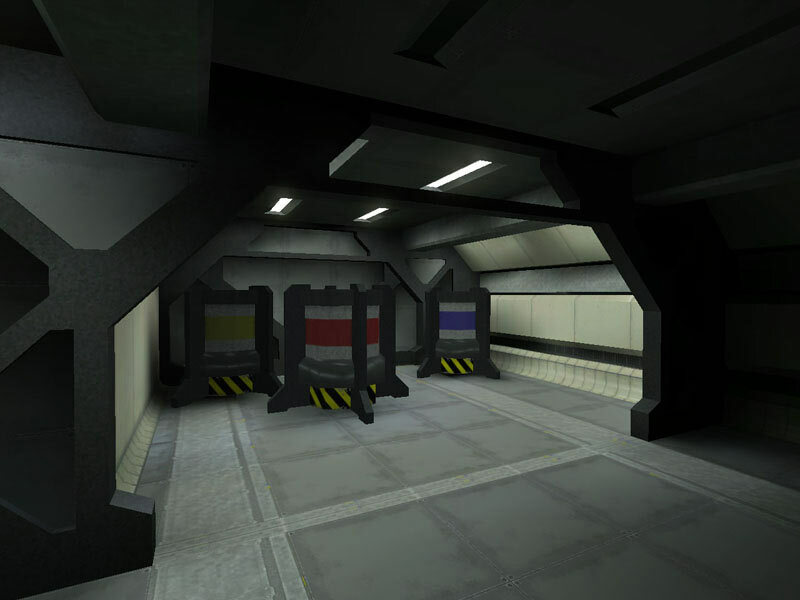 gear for fighters, shuttles, and transports, and the pilot's ready room; a briefing room and locker area for suiting up and flight equipment storage. Halcyon-class cruisers also had port and starboard shuttlebays. The port bay, at the outset of the Pillar of Autumn's mission in 2552, contained three Longsword fighters and three Pelican dropships. The starboard bay had been modified for Archer missile storage. There are several vehicle garages on the Autumn. 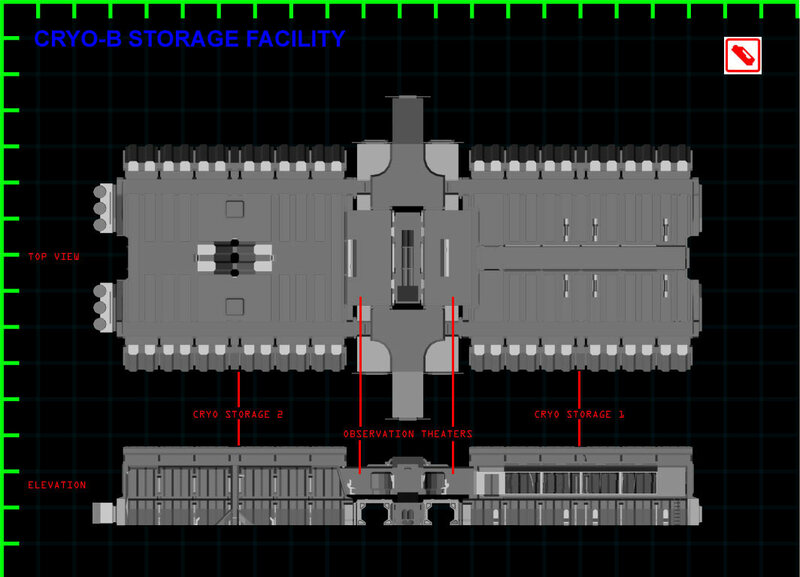 Most of the ground vehicles assigned to the Autumn are located on the lower decks (along with the ship's main magazine and cargo holds), but there's also a large vehicle storage facility below Launch Bay 7 near the dorsal of the ship. 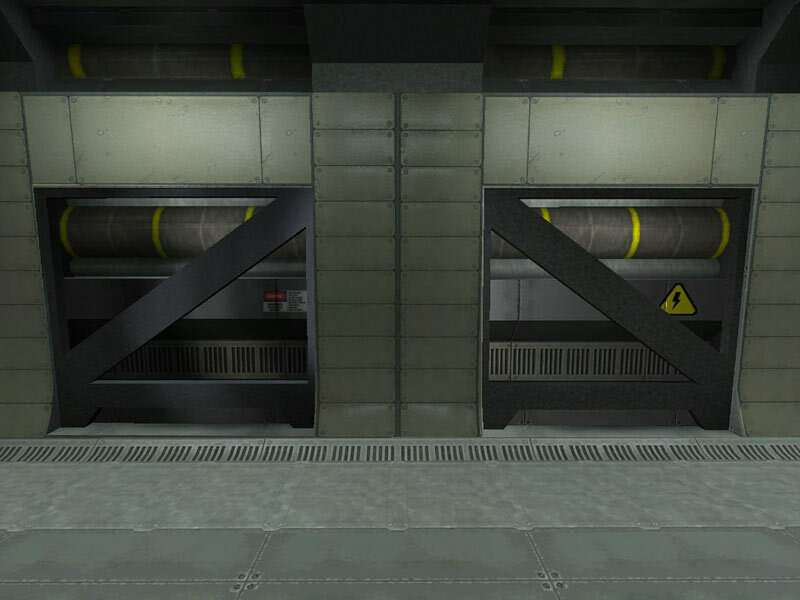 Large cargo elevators lead from the launch bay to the Scorpion tank storage depots. 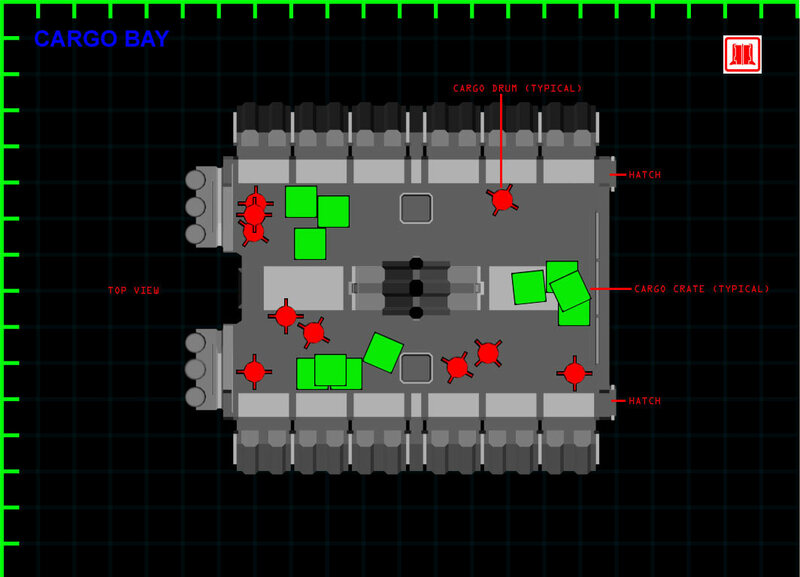 Areas under the main platforms, but still within the bay house fleets of Warthogs. 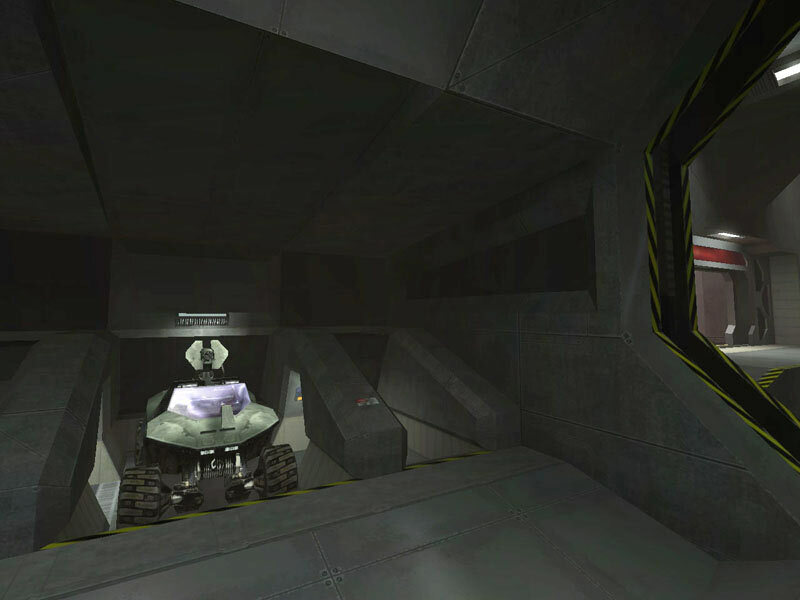 Warthogs are also located in smaller vehicle garages along the aft end of the dorsal service corridor. The Halcyon-class has external airlocks for the ejection of eighteen Bumblebee lifepods. With occupancy of 8 seated plus the pilot, this means of evacuation ideally accommodates 162 crew. 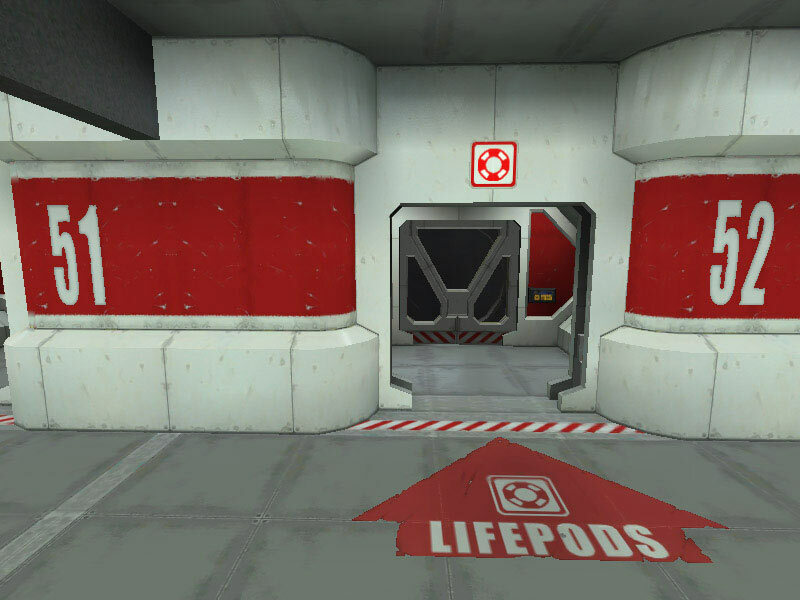 These lifepod stations are virtually identical to standard airlocks with the exception of the lifepod launch tube and exterior blast door. The red warning striping denotes vacuum beyond the bulkhead. 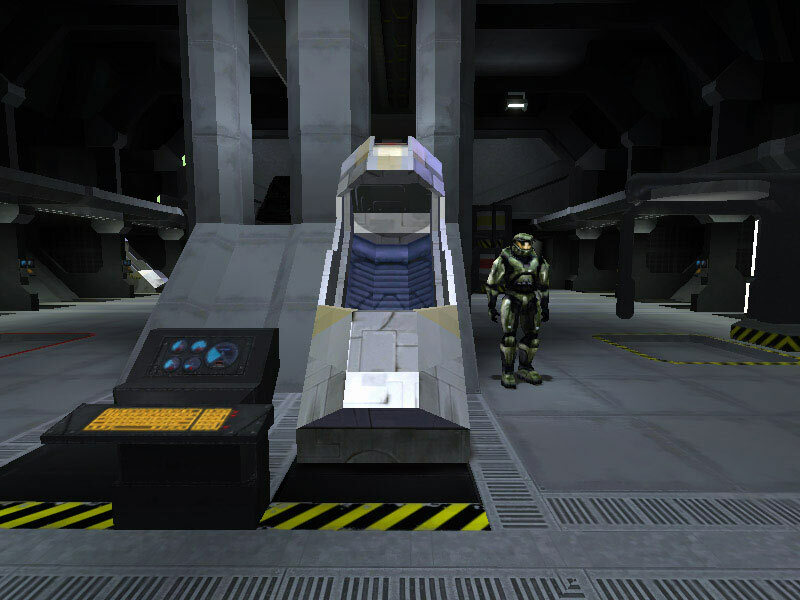 Standard equipment on many UNSC capital ships are deployable HEV pods for use by the UNSC Marine division of the special operations troops known as the ODSTs. 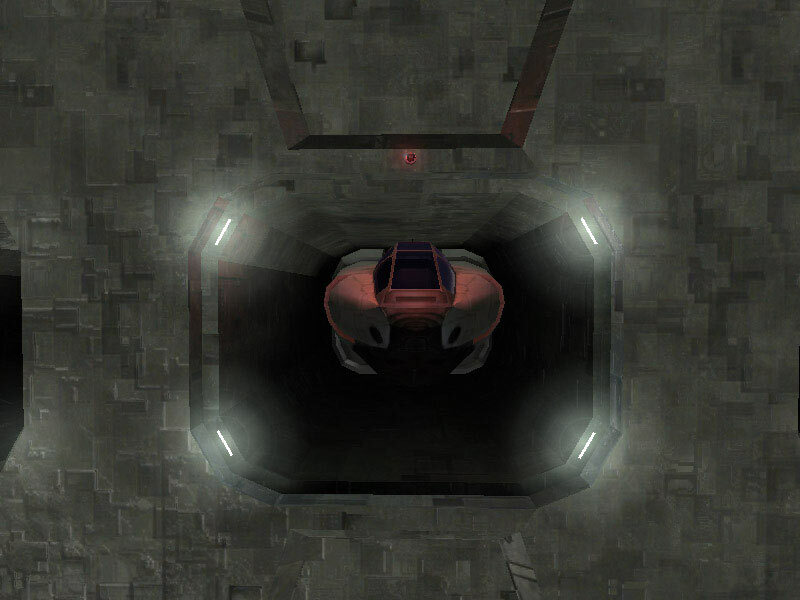 The HEV pods are single-occupant vehicles that drop from a ship in orbit of a planet and deploy the ODST soldier within to the surface. 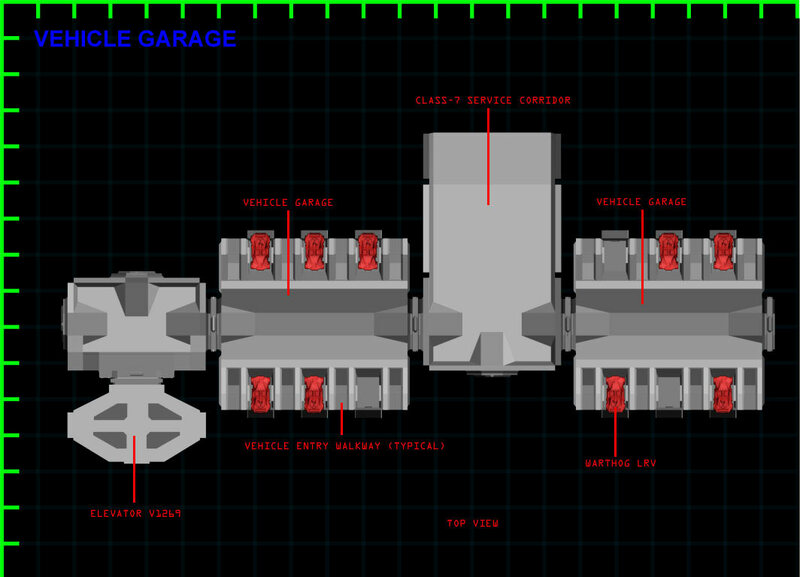 The HEV launch bays are compartments with HEV pods latched by large clamps on one side with a corridor on the other. 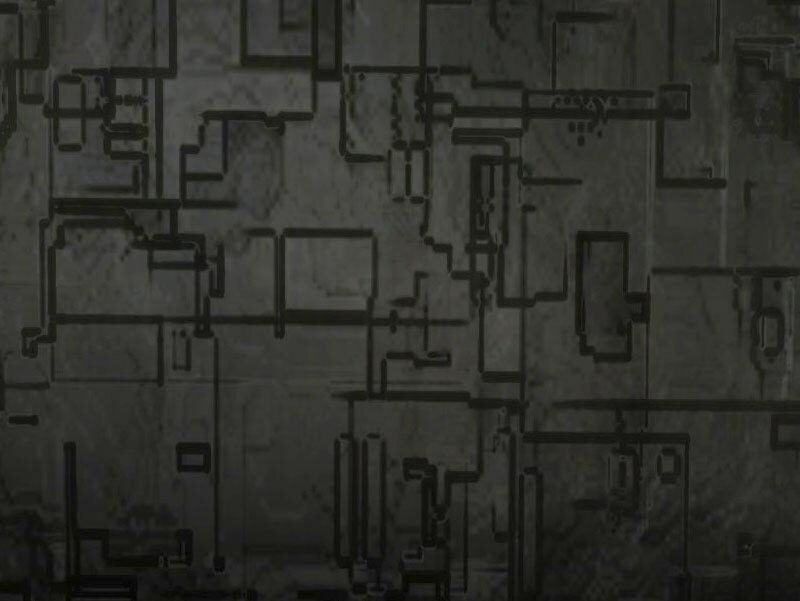 These areas are referred to by the Orbital Drop Shock Trooper "helljumpers" as "Hell's waiting room". 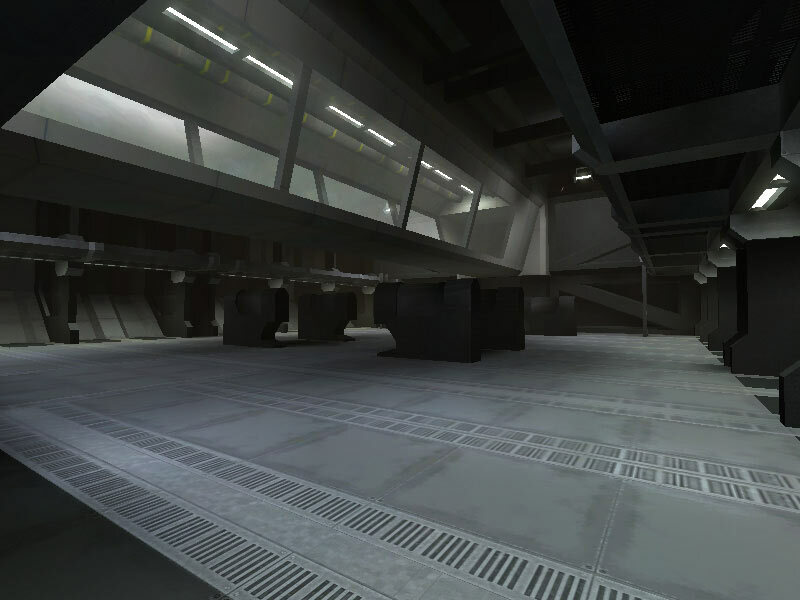 Weapons stowage is provided either in the HEV bay or is located nearby as are the suit lockers for the ODST ballistic armor.